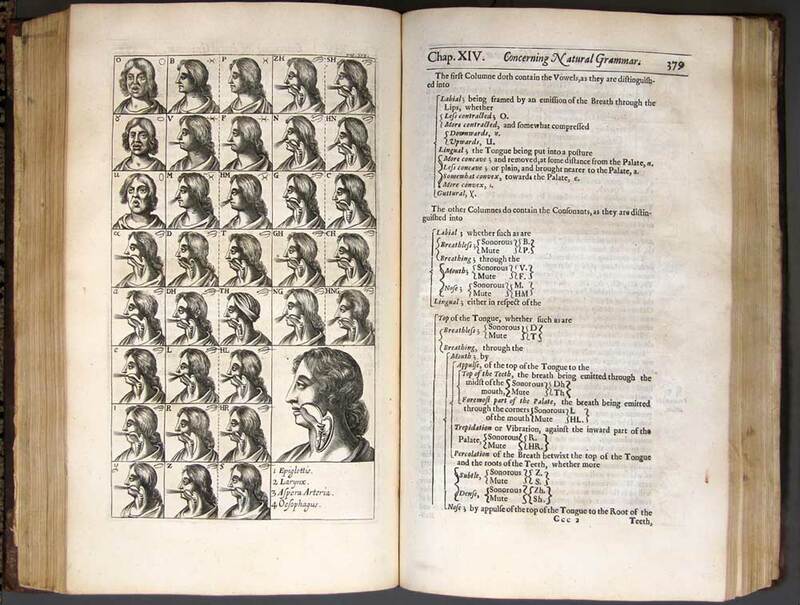 Combining classics from the past and cutting-edge works of the present day, this exhibition brings together books on philosophy, science, literature and medicine. Together they illustrate the theme of Experimental Philosophy as it was understood and practised 350 years ago and as it is understood today. In the seventeenth century an exciting new approach to the study of nature emerged and flourished in Europe. 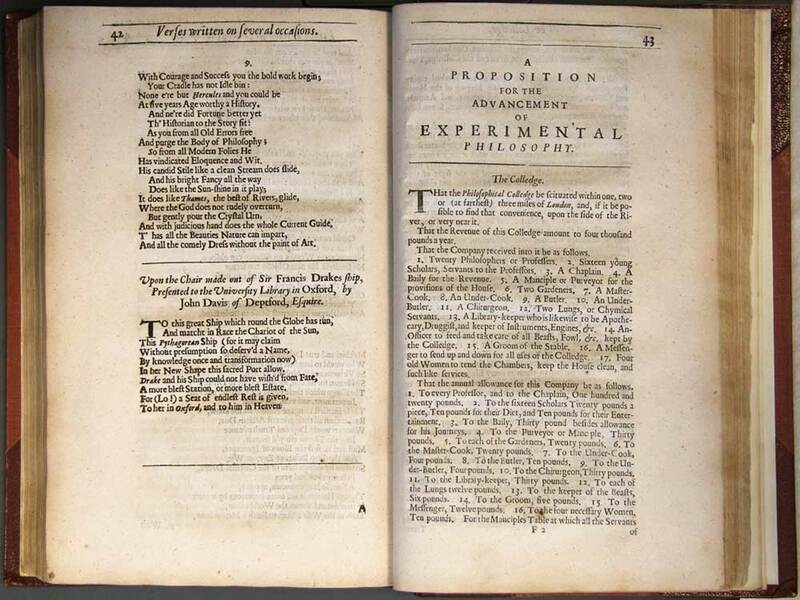 Its promoters called it Experimental Philosophy and it boasted some of the greatest minds of the age, including Isaac Newton, John Locke and Robert Boyle. 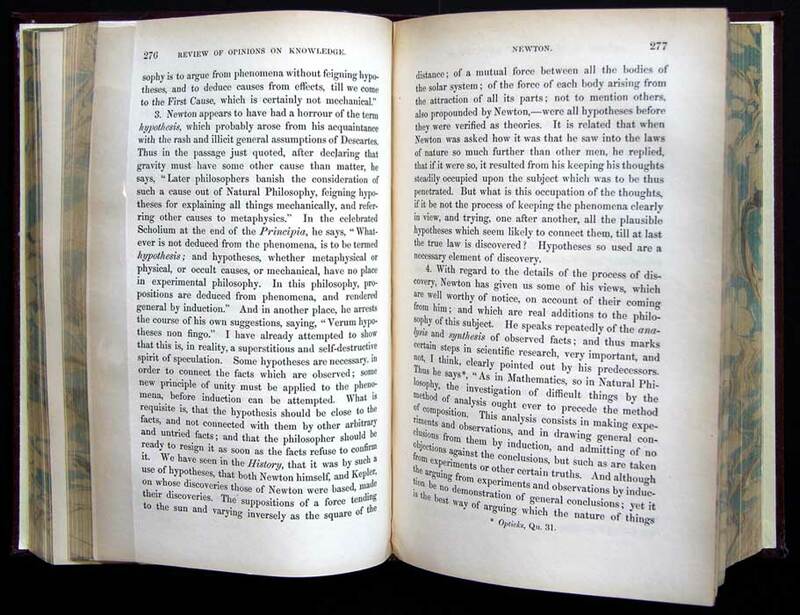 Experimental Philosophy was set against Speculative Philosophy and the distinction between Experimental and Speculative Philosophy provided the primary terms of reference by which natural philosophy was understood in the 17th and 18th centuries. Eventually, however, the distinction between Experimental and Speculative philosophy was eclipsed by a distinction deriving from the great German philosopher Immanuel Kant and his followers, namely the distinction between rationalism and empiricism. From the late 19th century it is this post-Kantian distinction that has come to dominate the way we view early modern philosophy. The old Experimental Philosophy has all but disappeared from view. In recent years, however, a new form of Experimental Philosophy has emerged amongst analytic philosophers. The 'new' experimental philosophers claim that for too long philosophers have sat in their armchairs and have reasoned from intuitions and untested assumptions about such things as the nature of belief, the nature of human character, and human motivation. It's time for philosophers to get out of their armchairs, join the experimental scientists and engage in 'experimental philosophy'. 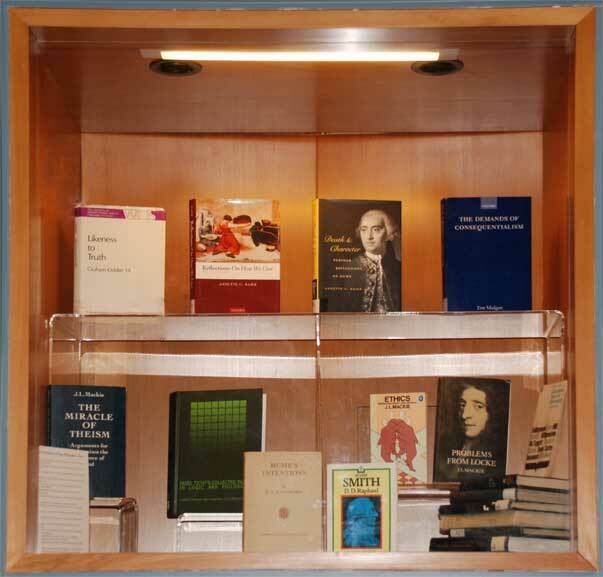 Notable items on display include a second edition of Isaac Newton's Philosophiae Naturalis Principia Mathematica (1713), Francis Bacon's Of the Advancement Learning (1640), poet Abraham Cowley's 'A Proposition for the Advancement of Experimental Philosophy' (1668), and an exciting new discovery concerning the philosopher David Hume. Experimental Philosophy: Old and New will run from 1 July 2011 to 23 September 2011, and is mounted to coincide with the Australasian Association of Philosophy Conference, 3–8 July 2011 at the University of Otago. Images can be supplied for promotion purposes. Francis Bacon was regarded as the father of the experimental philosophy. 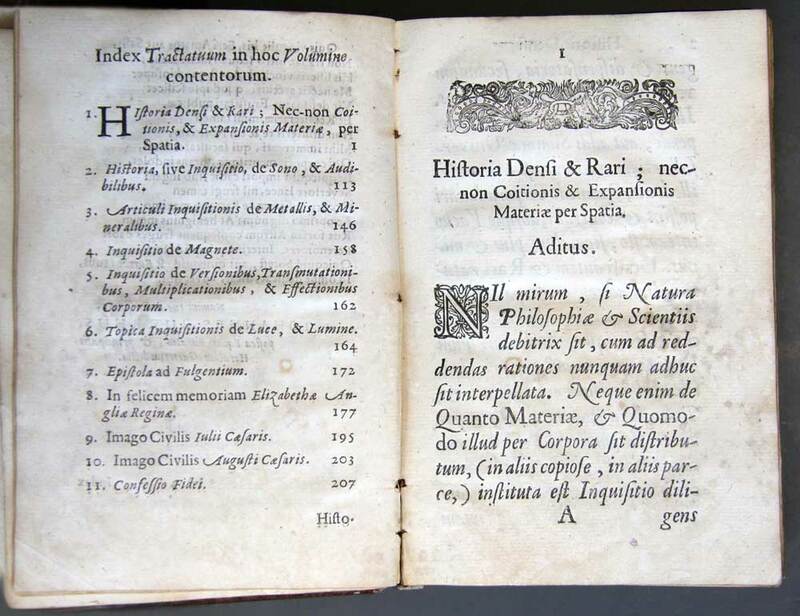 This English translation of his De augmentis scientiarum (1623) contains both a detailed scheme of the sciences and a description of Bacon’s famous method for the interpretation of nature. This method contains what is effectively the first ever philosophy of experiment. 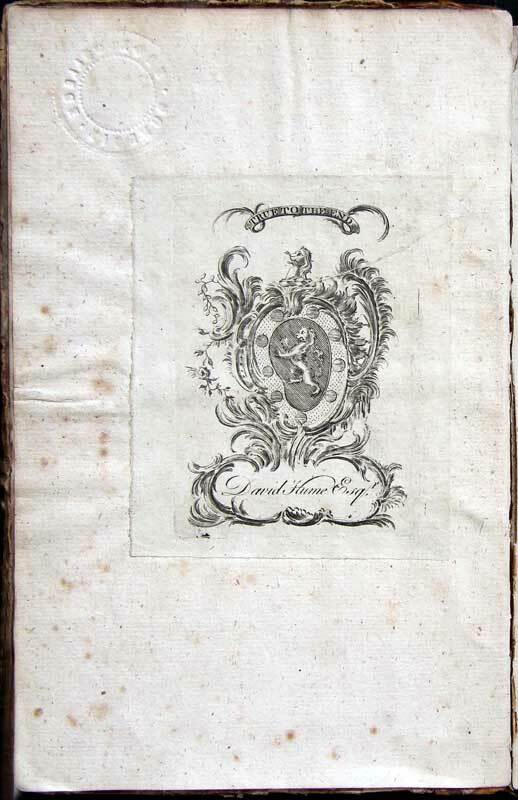 The frontispiece is an adaptation of the famous frontispiece used in his Instauratio magna (The Great Instauration) and is rich in symbolism. 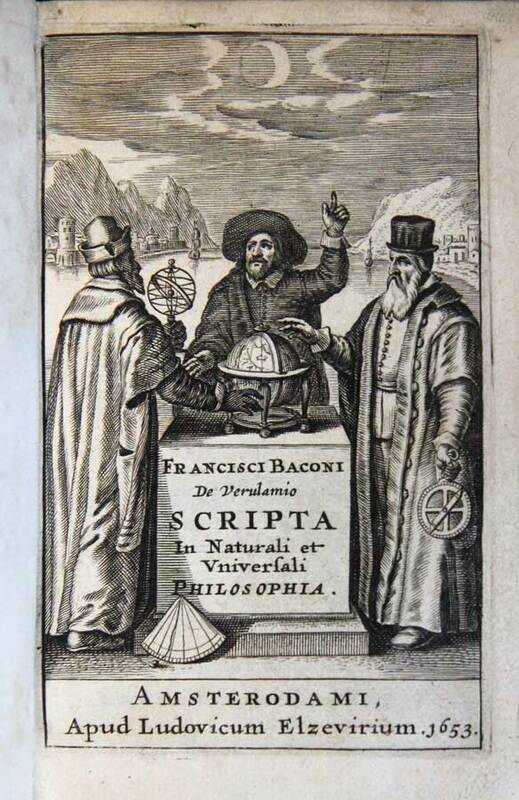 Francis Bacon’s Scripta is a collection of posthumous writings published by Isaac Gruter. 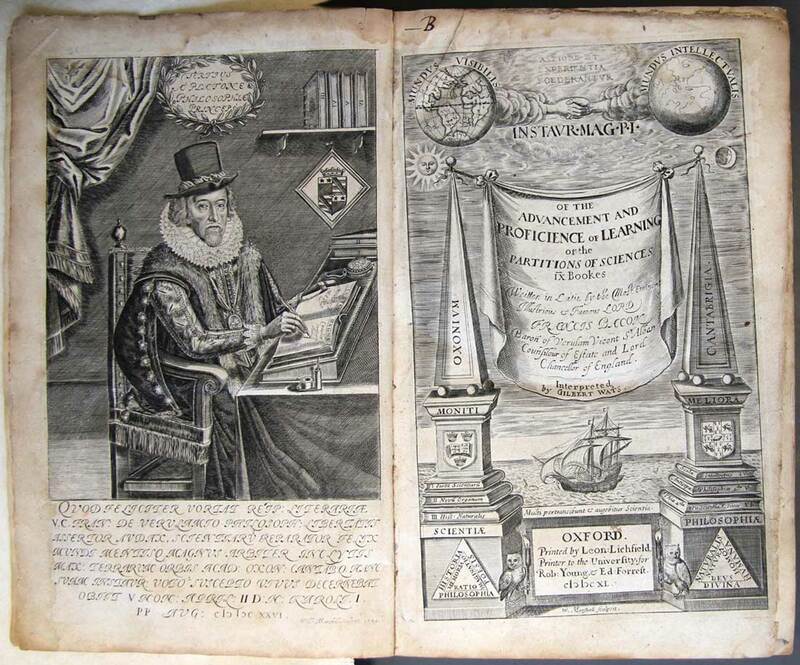 It was a crucial source for Bacon’s methodological views for the Fellows of the early Royal Society. 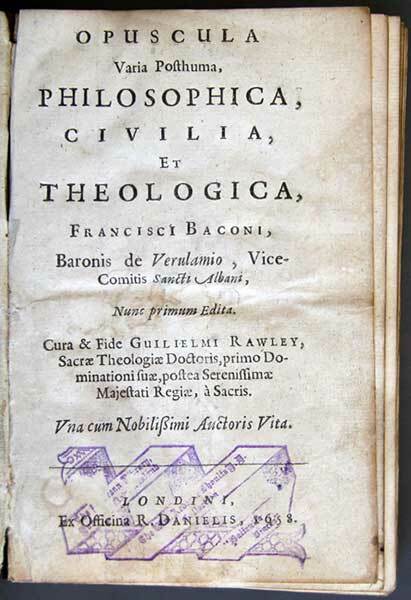 In particular, the essay on ‘Description of the intellectual globe’ outlines the theory and content of Bacon’s method of natural history, a method that was to come to dominate the method of the Royal Society in the last four decades of the seventeenth century. 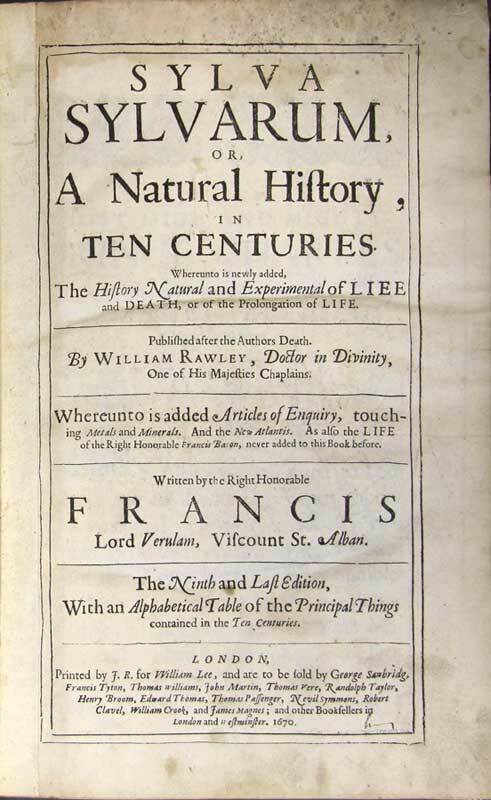 This posthumous edition of some of Francis Bacon’s natural historical writings provided models for the way to apply Bacon’s natural historical method. 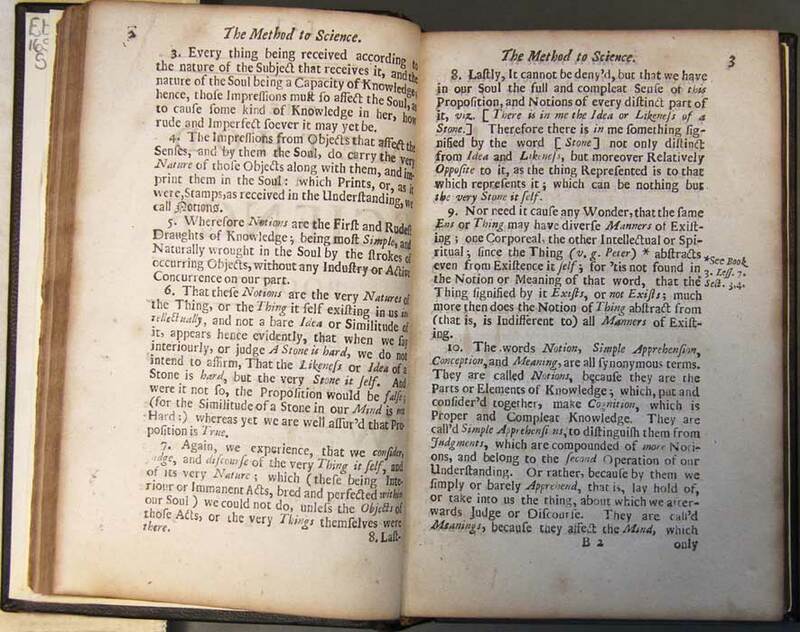 In the 17th century there was virtually no interest in Bacon’s inductive method. 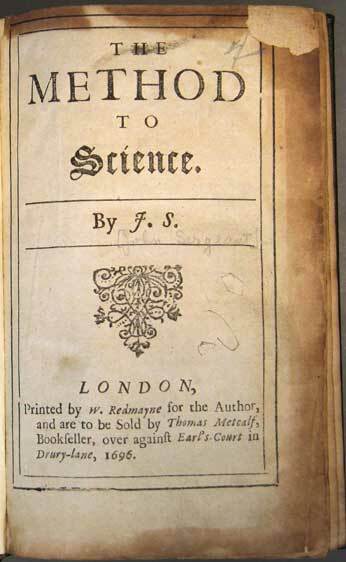 Instead, it was his natural histories, containing numerous experiments and observations, which were the model for the ‘science’ of the day. Bacon’s natural histories were not works of classification, but of experimental projects. 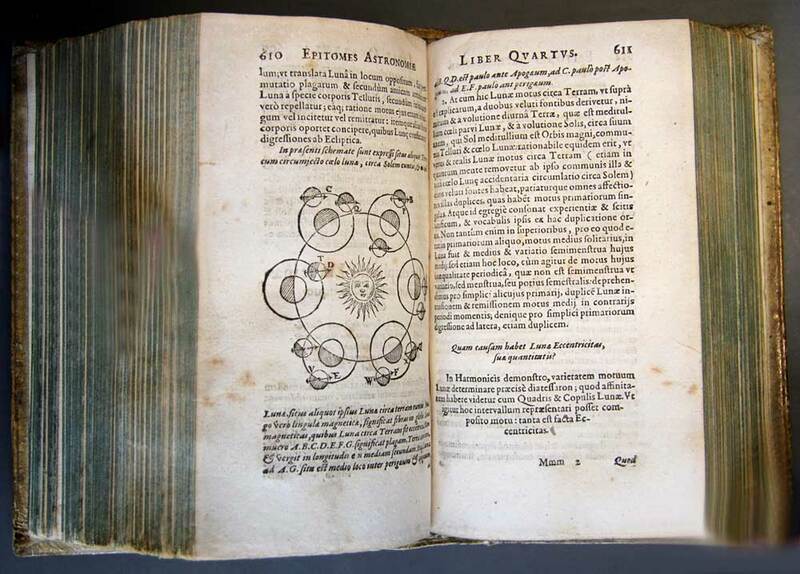 Kepler’s three volume Epitome became the most influential introductory text on the heliocentric theory of the cosmos. 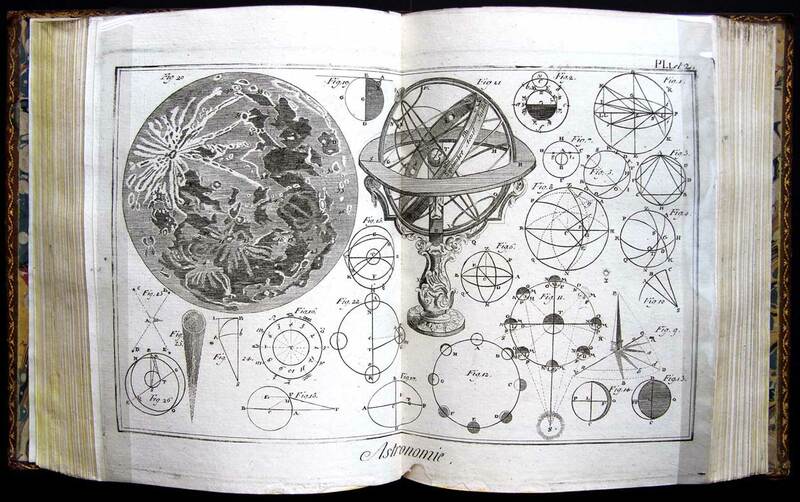 The importance of the role of observation and instruments in the establishment of the Copernican heliocentric theory was widely recognized by the early experimental philosophers. After Descartes Pierre Gassendi was the leading French philosopher in France in the first half of the 17th century. 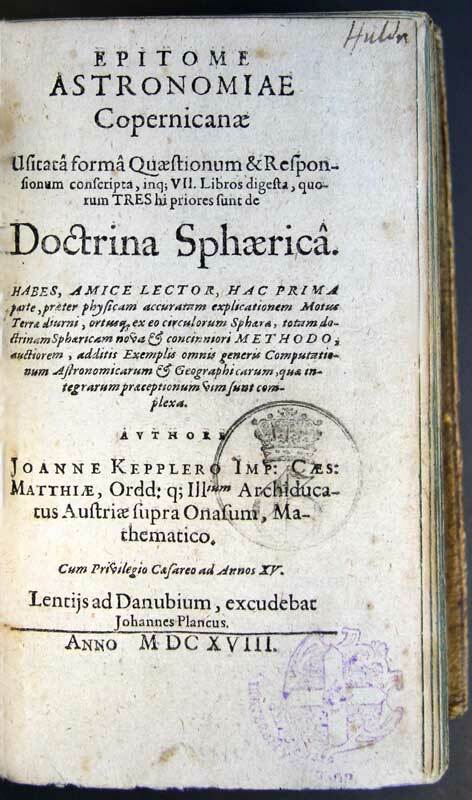 In addition to reviving and ‘baptizing’ Epicurus’ atomism, he had strong interests in natural philosophy. 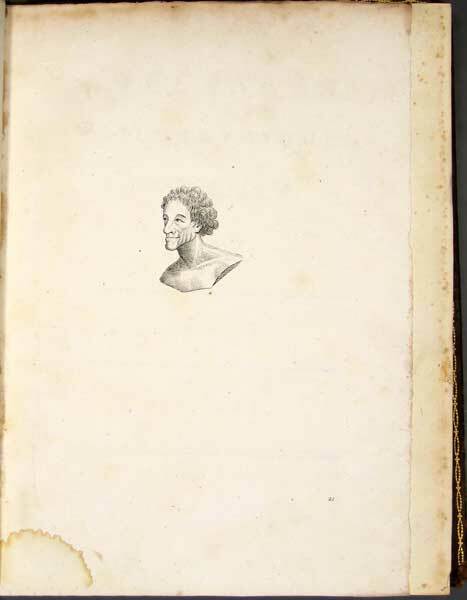 In his ‘Life of Peiresc’ displayed here, he tells how Nicolas Fabri de Peiresc acted as a patron to those natural philosophers who practised experimentation, including Galileo. 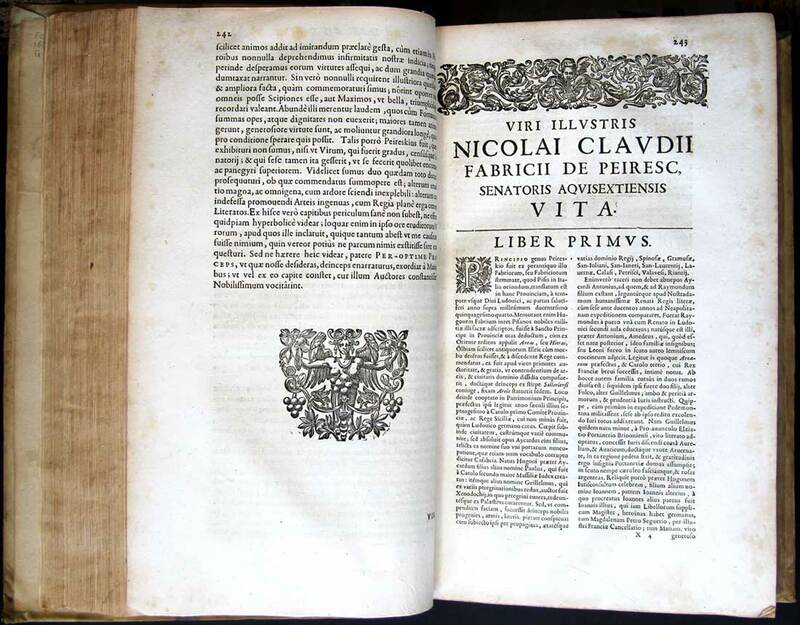 Peiresc came to be regarded as one of the earliest patrons and promoters of the experimental philosophy, largely as a result of Gassendi’s biography. Harvey is best known for his discovery of the circulation of the blood, and rightly so. It was the observational and experimental evidence that Harvey provided that led to the almost universal acceptance of the theory of circulation. Harvey’s views on the role of observation in medicine are spelt out in the Preface to this work on the generation of animals. His example and writings were to have a lasting impact on the early experimental philosophers, many of whom worked on animal physiology. Bacon’s Sylva was popularly known as his Natural History and was the most widely read of all of Bacon’s writings in the 17th century. 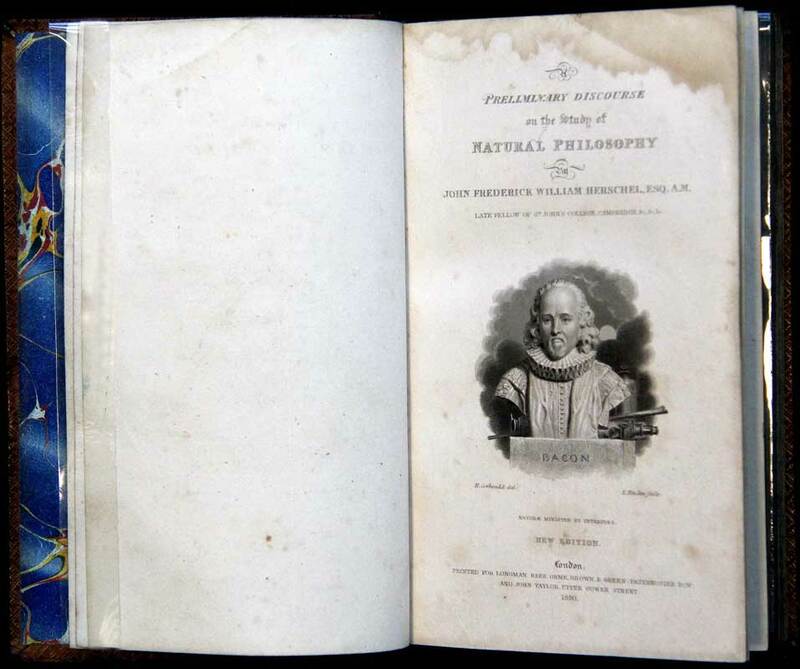 It contains ten centuries of observations and experiments and provided a template for the collection of facts by experimental philosophers. 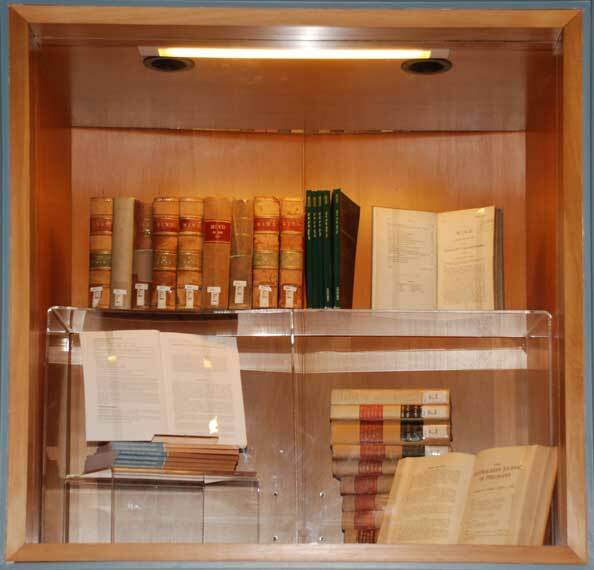 The edition displayed here is the first Latin translation and was published by Elsevier. 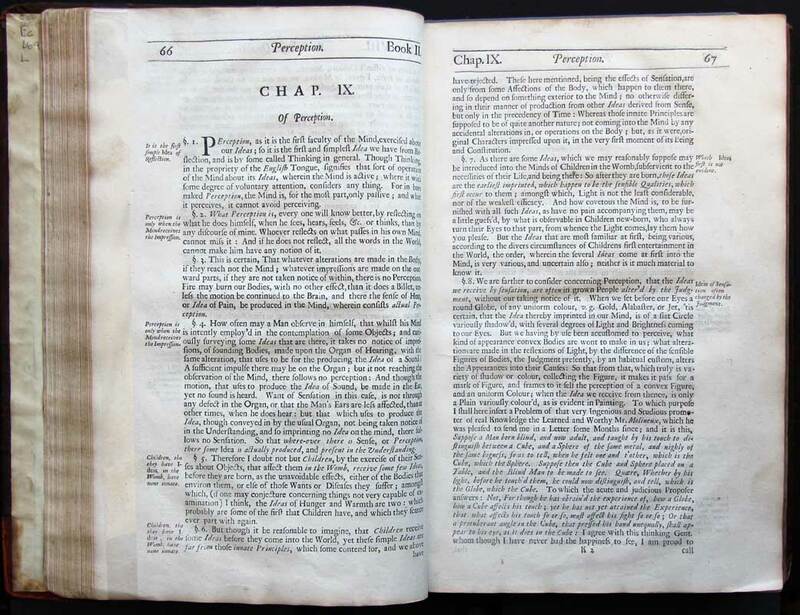 Wilkins’ Essay towards a Real Character is the most famous of a whole range of universal language projects that flourished in the mid- to late 17th century. Closely aligned with the nascent Royal Society, this work sought to develop a language that would supersede all natural languages. The project was to be intimately tied to the study of natural philosophy. 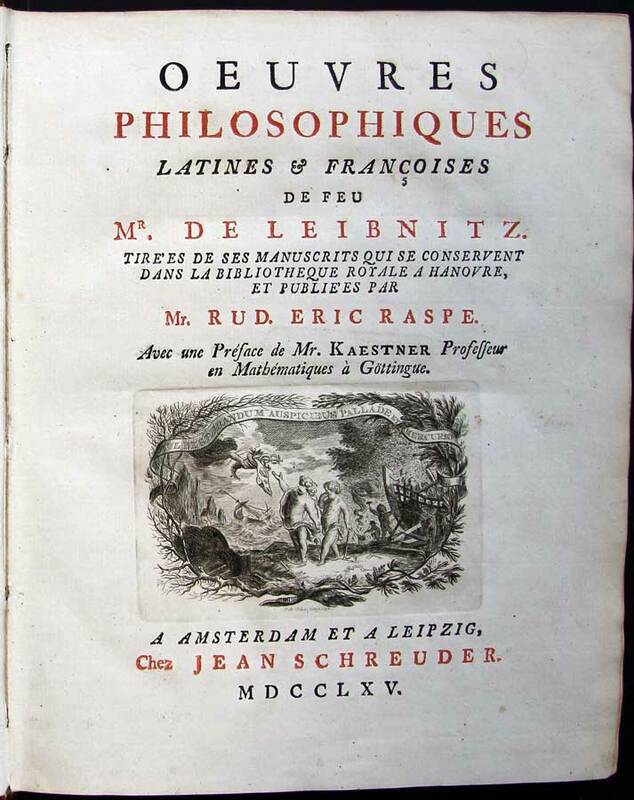 The German philosopher Leibniz is one of many who were inspired by this work to contribute to the universal language project. 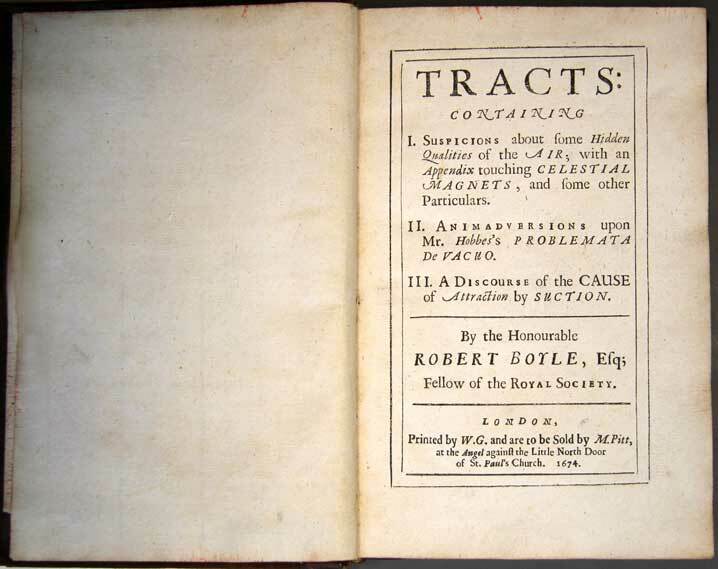 In addition to his many natural histories and his more speculative works concerning the corpuscular philosophy, Robert Boyle published a number of collections of tracts. These were often assemblages of disparate writings. 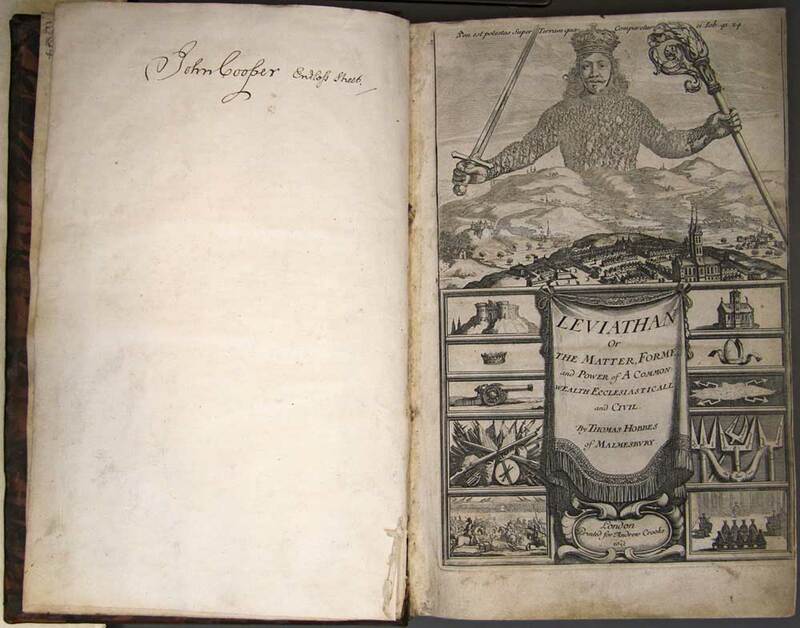 The tract displayed here is his ‘Animadversions upon Mr Hobbes’ Problemata de Vacuo’, which is a reply to Thomas Hobbes’ Problemata physica (1662). 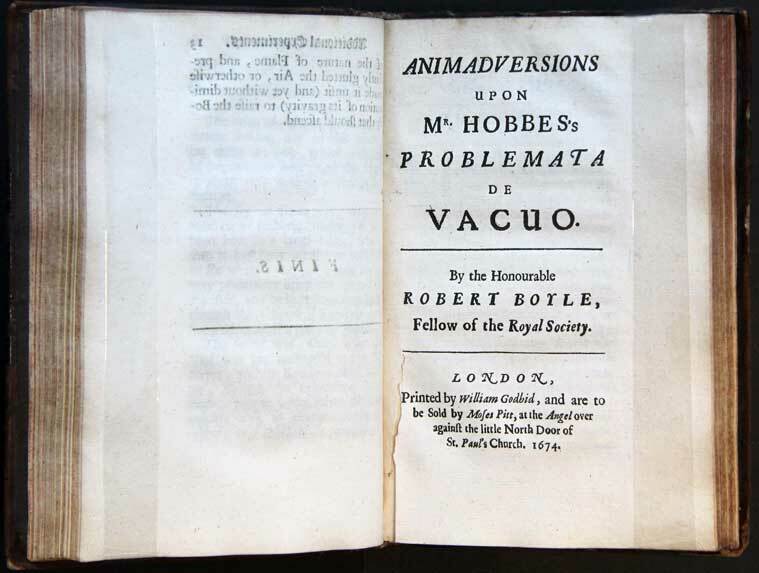 Hobbes’ work was one of the most overt attacks on the experimental philosophy and was directed against Boyle’s air-pump experiments. Boyle’s reply to Hobbes, is, among other things, an attempt to vindicate the experimental philosophy. 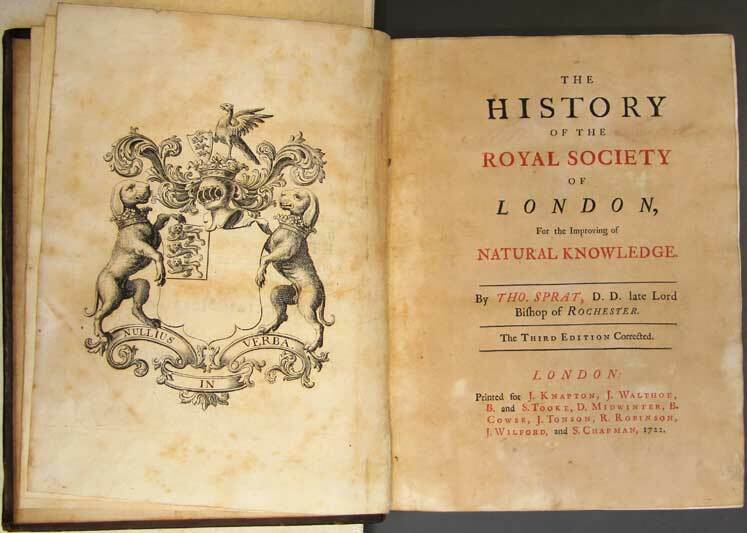 Sprat’s History of the Royal Society was first published in 1667, just seven years after the founding of the Society. From its earliest years the Society and the experimental philosophy had come under attack. Sprat’s History is an attempt to vindicate the Society’s method and achievements. He notes that ‘Experimental Philosophy will prevent mens spending the strength of their thoughts about Disputes’ which are the preoccupation of the ‘meer Speculative Philosopher’. 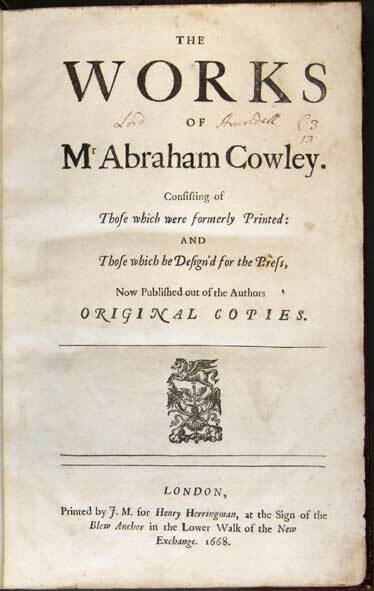 Cowley is best known as a leading Restoration poet. 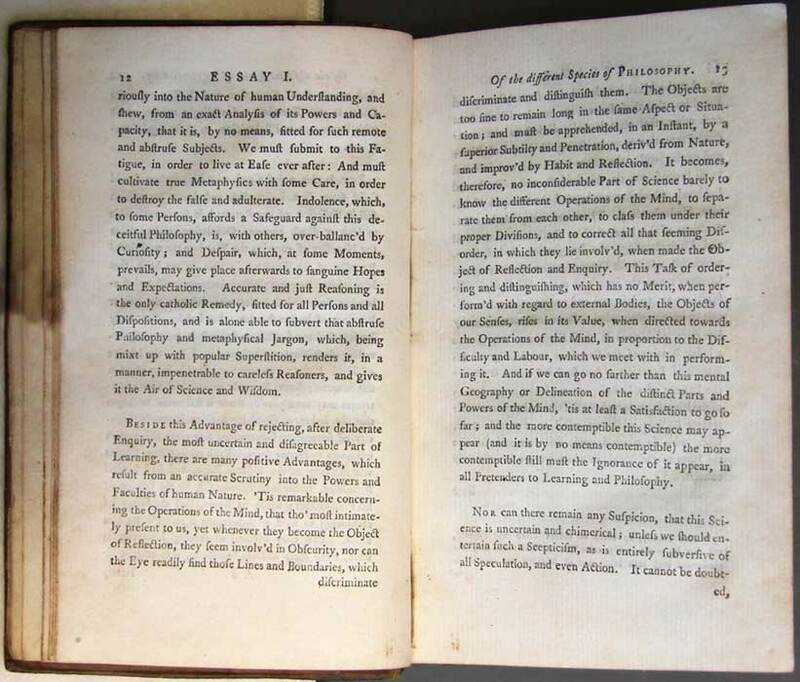 He was, however, an early Fellow of the Royal Society and in this work recommended that the Society appoint 16 professors who are ‘bound to study and teach all sorts of Natural, Experimental Philosophy, to consist of the Mathematicks, Mechanicks, Medicine, Anatomy, Chymistry, the History of Animals, Plants .... and briefly all things contained in the Catalogue of Natural Histories annexed to My Lord Bacon’s Organon’. Clearly Cowley conceived of the Society as the implementation of Bacon’s vision. Like Sprat’s History, Glanvill’s Plus Ultra is both a defence of the Royal Society and a statement of the vision and achievements of the new philosophy. Glanvill states that the main aim of the Society ‘is to erect a well-grounded Natural History … we must seek and gather, observe and examine … This is the business of the Experimental Philosophers’. John Sergeant was an opponent of the philosopher John Locke. 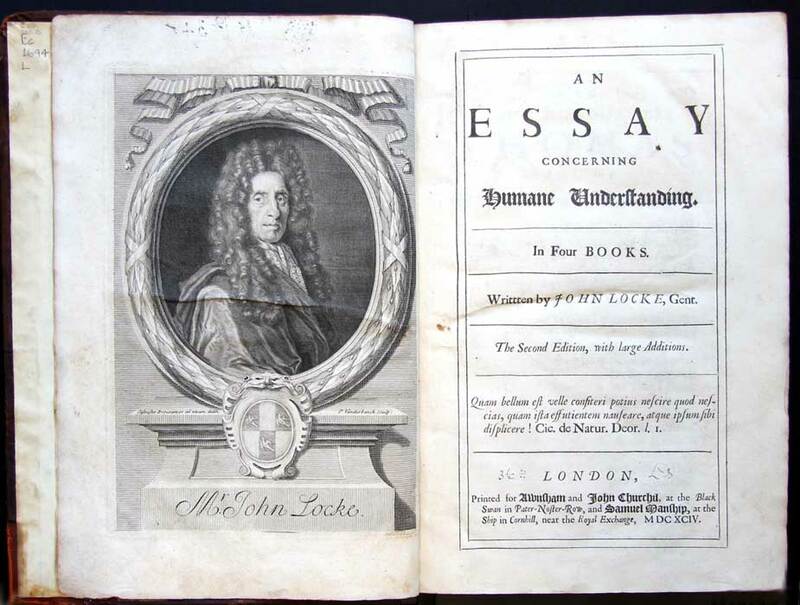 His Method to Science presents an alternative account of the operations of the understanding to that of Locke. In keeping with the prevailing view of the day, Sergeant claims that the methods he will examine are ‘that of Speculative, and that of Experimental Philosophers’. Hobbes was the most outspoken critic of the experimental philosophy in its early years. 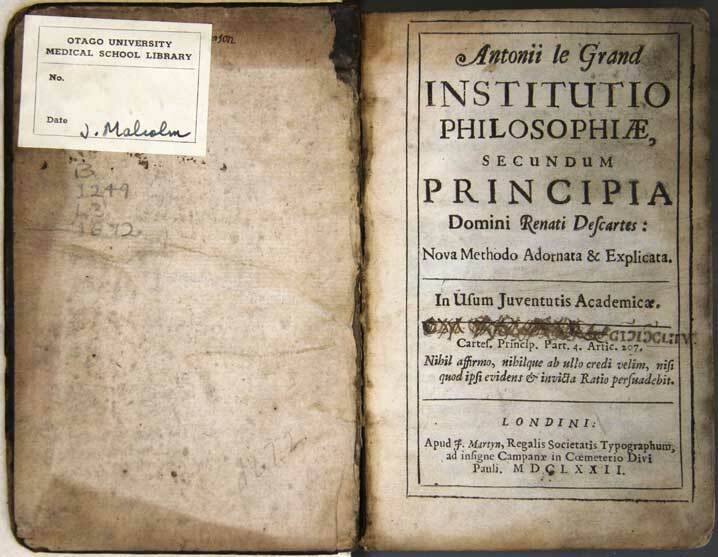 He attacked it in his Dialogus physicus of 1661, in which he claims that natural philosophy should be derived from first principles. Hobbes believed that the same principles could be used to derive the rules of politics and ethics. 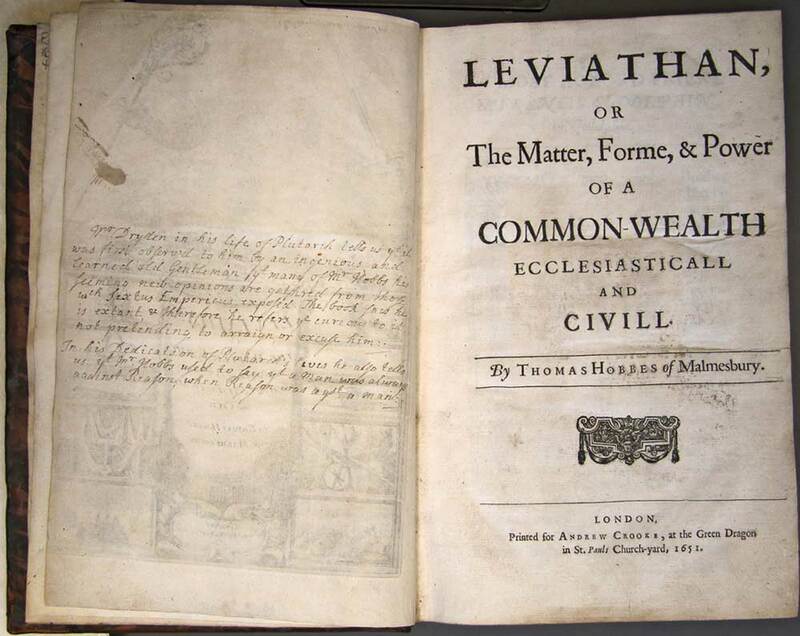 His most famous work, Leviathan, on display here, is prefaced with a summary of his natural philosophy, which lays out the principles upon which his political theory is based. John Sergeant’s Solid Philosophy Asserted is a sequel to his Method to Science. 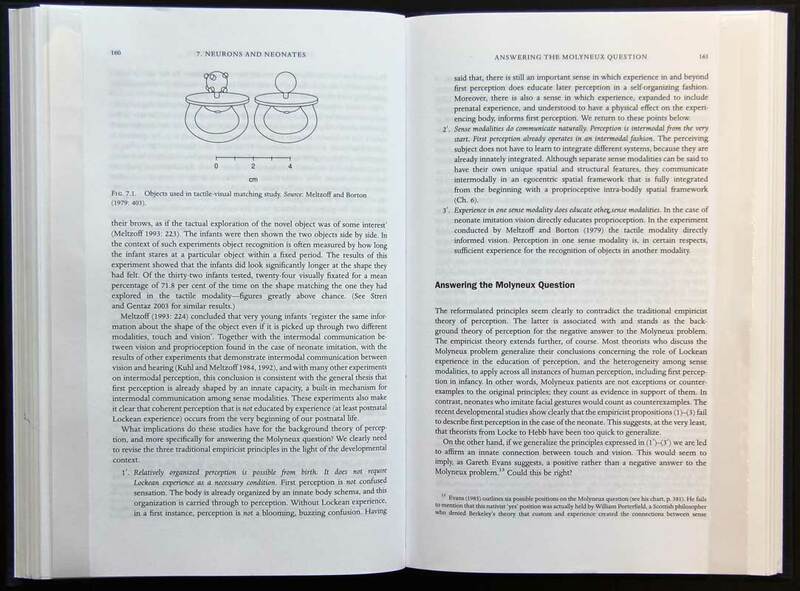 In both works Sergeant is committed to developing a demonstrative method for science, reasoning from first principles. This is the sort of method that the experimental philosophers opposed. 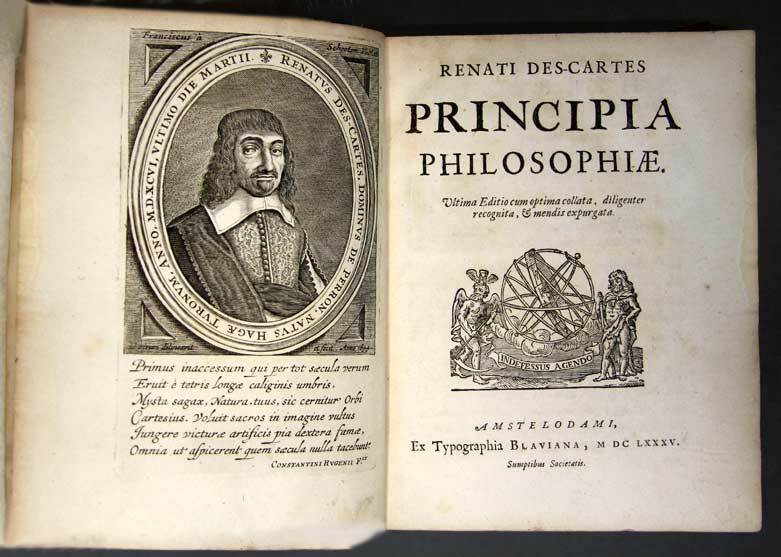 Descartes’ Principles of Philosophy, included in this volume, presents a cosmological theory based upon first principles. It is the vortex theory of planetary motions and it was the most widely held theory of the structure and origins of the cosmos until Newton’s own Principia (Principles) displaced it. 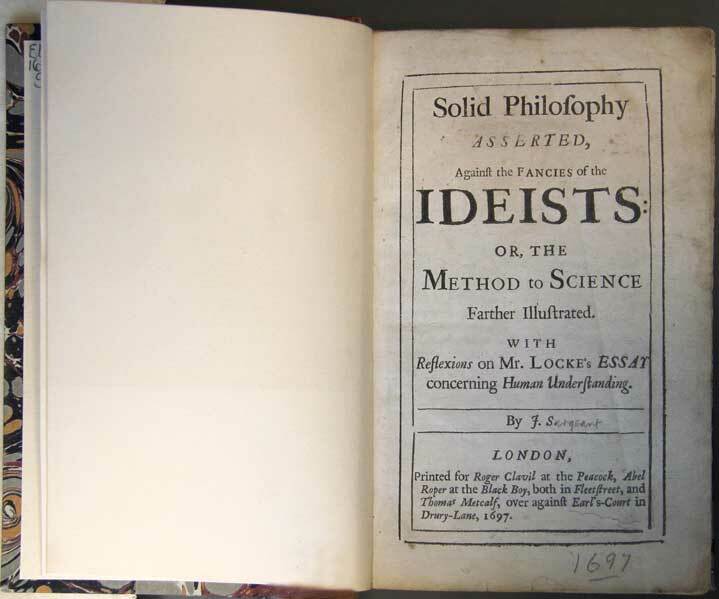 From the late 1680s in England, however, Descartes’ system began to be regarded as a paradigm of speculative philosophy in contrast to Newton’s theory, which was developed using the experimental philosophy. 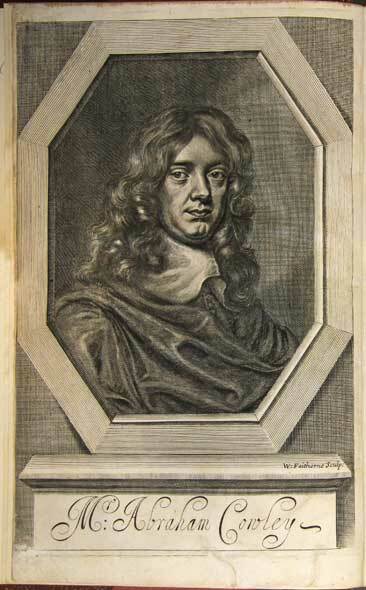 Malebranche was the leading Cartesian philosopher in the second half of the 17th century. The followers of Descartes tended to hold an ambiguous position vis-à-vis the experimental philosophy. On the one hand, they accepted the speculative principles of Descartes, and on the other many of them kept abreast of developments within natural philosophy and even promoted the use of experiments. 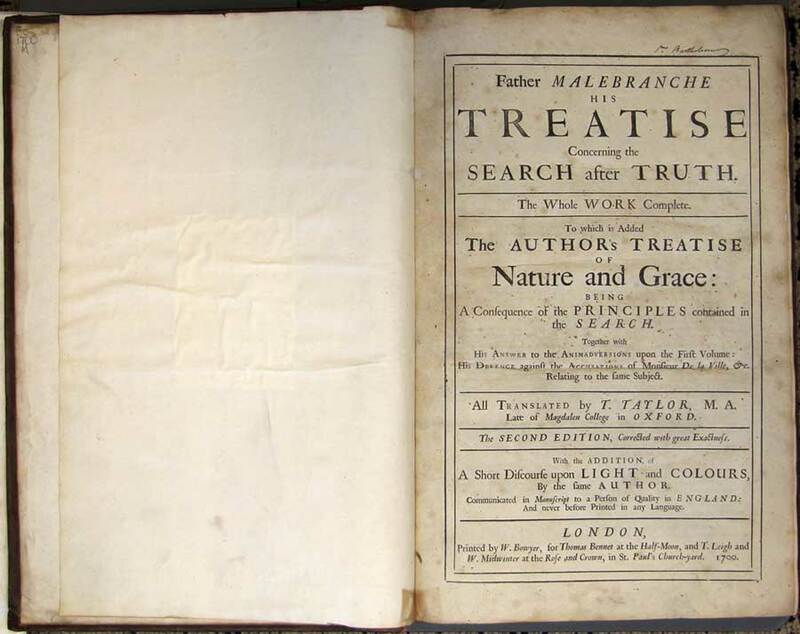 The Search after Truth is Malebranche’s most influential work. 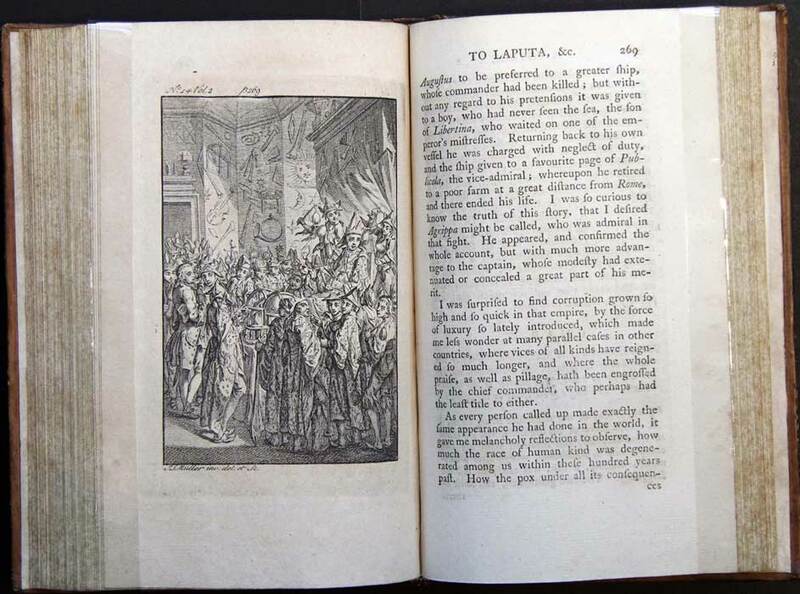 It was widely read in translation in Britain and influenced both Berkeley and Hume. 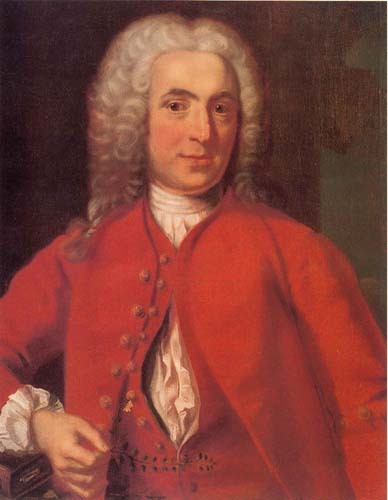 Antoine Le Grand was born in France but spent much of his adult life in England, where he was one of the leading Cartesians. 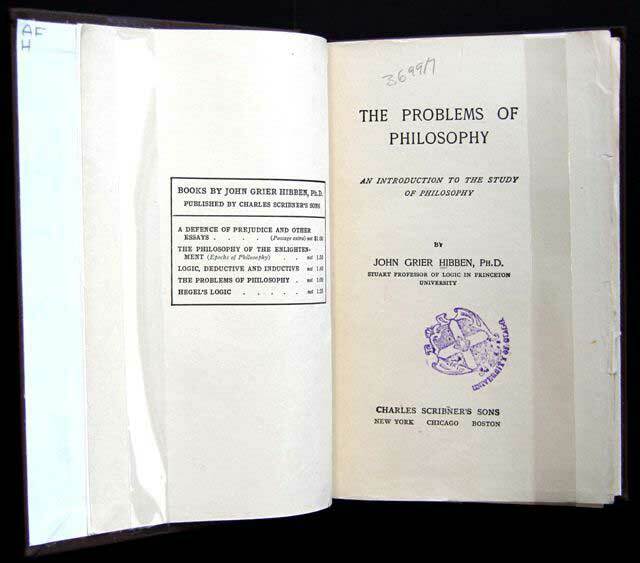 His Institutes present the Cartesian system, though the second book is a ‘History of Nature’ in the spirit of the experimental philosophy, providing numerous observations and experiments in support of Cartesian natural philosophy. Le Grand’s writings were harshly criticized by the speculative philosopher John Sergeant (see Drawer 5), who also attacked John Locke. 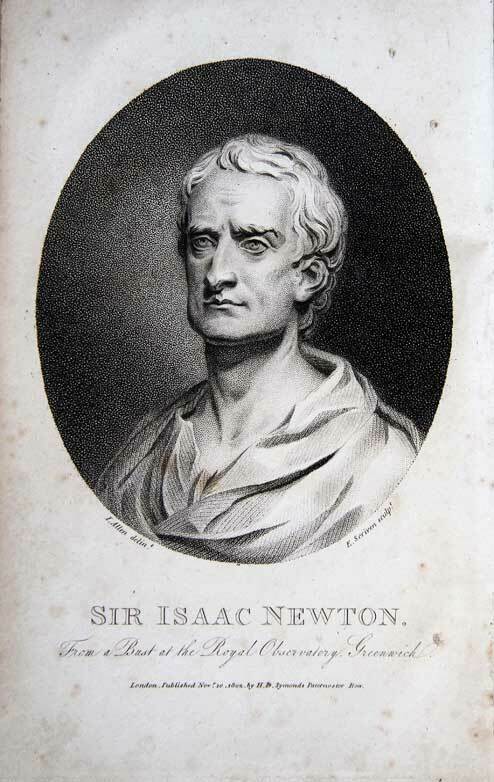 Sir Isaac Newton was the most important and revered experimental philosopher of the early modern period. His writings and Presidency of the Royal Society had an enormous impact on the method and practice of the experimental philosophy. 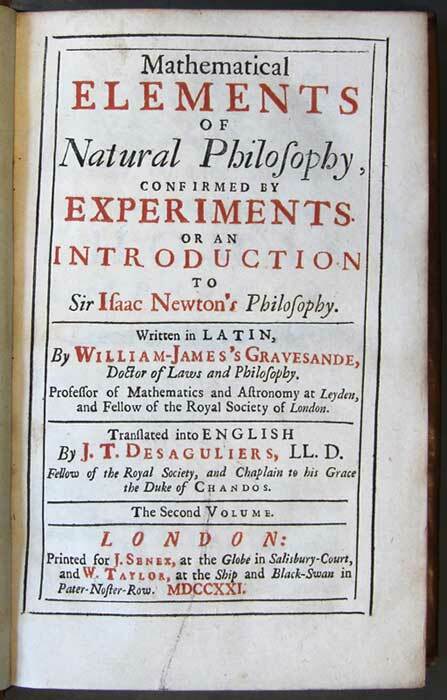 The main way in which the experimental philosophy was practised before Newton’s ascendency was according to the Baconian method of natural history. 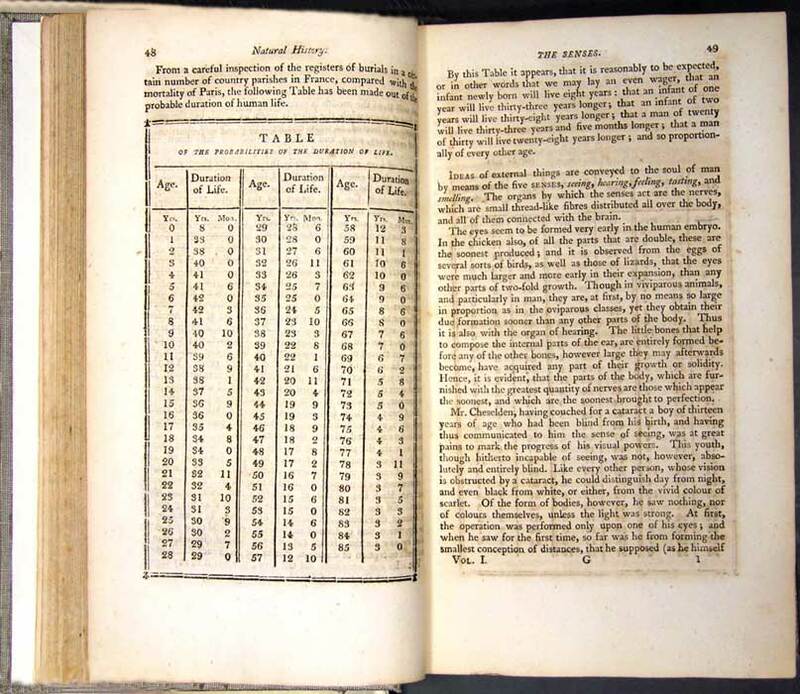 From the 1690s, however, this method was superseded by an approach to natural philosophy that emulated Newton’s mathematical experimental philosophy. 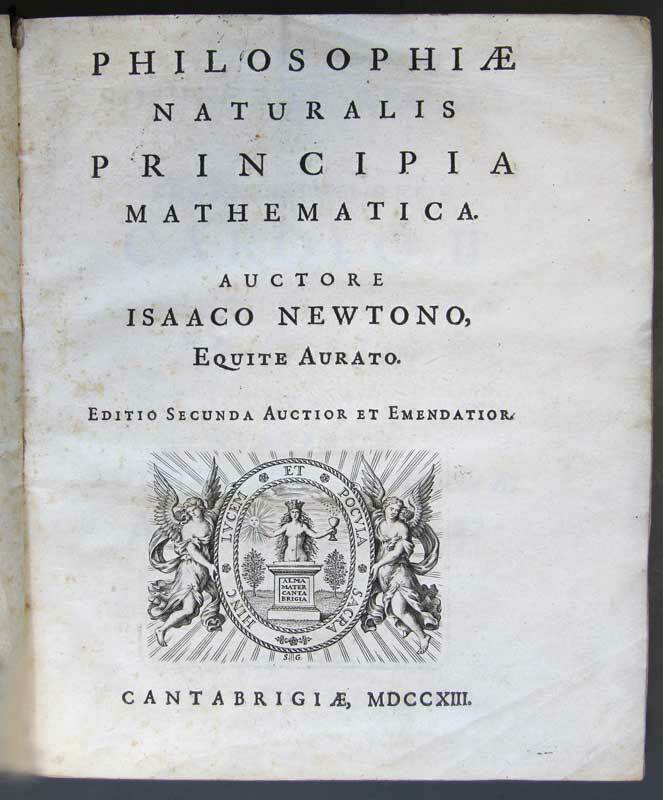 The Newtonian method was widely believed to be that which afforded Newton’s Principia (1687) its phenomenal success. This method has two facets. 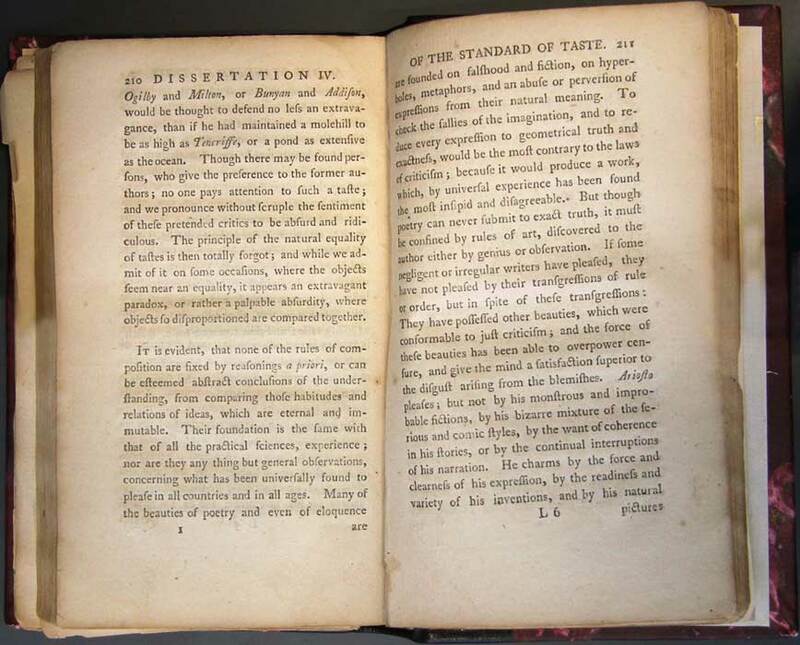 The first is Newton’s attempt to demonstrate his propositions “strictly and geometrically” by formulating lemmas, propositions and corollaries from axioms. The second facet is his attempt to explain and confirm the certainty of his propositions by the use of experiments. He restricts these discussions to scholia, to ensure that the two methods are kept separate. The separation of mathematical and experimental reasoning is an enduring theme in Newton’s methodological discussions. 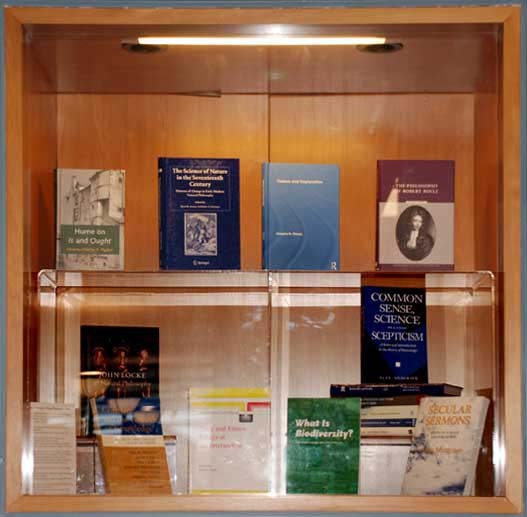 The books on display here show how widely ‘Newtonianism’ spread, both in terms of geographical reach and across different disciplinary domains. 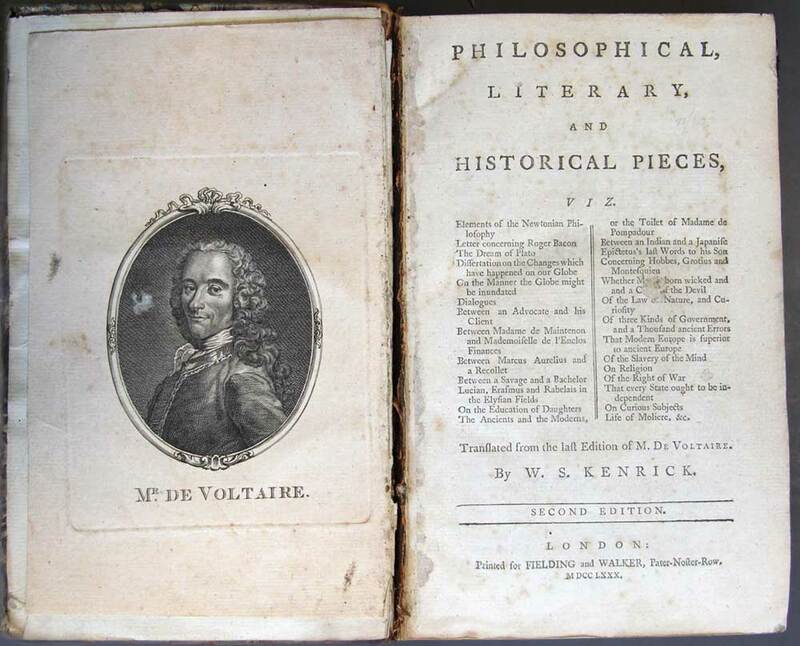 Voltaire, Philosophical, Literary, and Historical Pieces, viz. 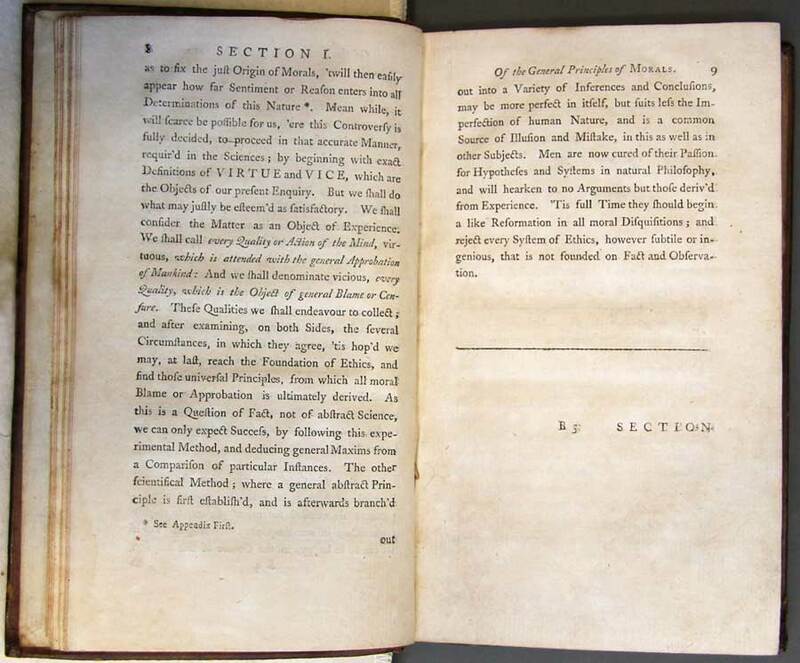 Elements of Newtonian Philosophy Letter concerning Roger Bacon… Life of Moliere, &c. 2nd ed. London: Printed for Fielding and Walker, 1780. de Beer Eb 1780 V.
MacLaurin (1698–1746) was considered to be the protégé of Newton. 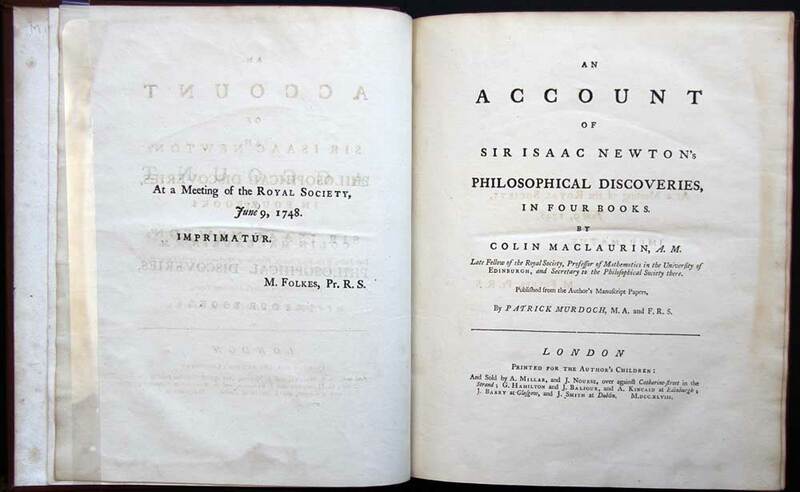 His An Account of Sir Isaac Newton’s Philosophical Discoveries, published posthumously in 1748, was an important conduit for the spread of Newton’s philosophy in Scotland. MacLaurin writes (pp. 90-91): "We may, at length, rest satisfied, that in natural philosophy, truth is to be discovered by experiment and observation, with the aid of geometry, only...". Whiston (1667–1752) succeeded Newton as the Lucasian Professor at Cambridge. 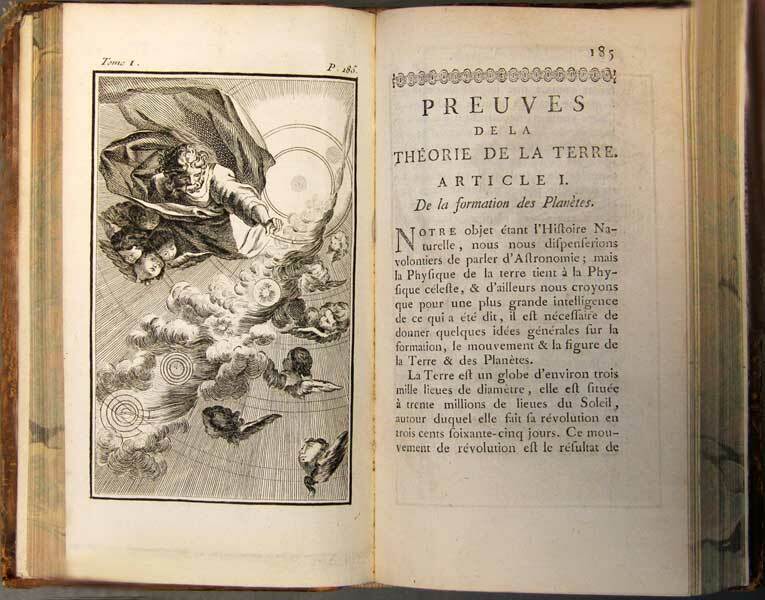 His A New Theory of the Earth, first published in 1696, gives a theory of the divine creation of the Earth that is consistent with Newtonian mechanics. 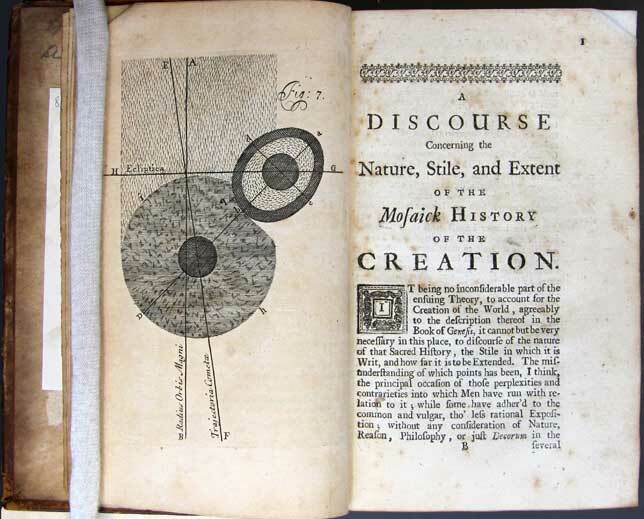 What is fascinating about this work is that Whiston imitates the method of Newton’s Principia, providing propositions, axioms, lemmata and scholia in order to give the work an authority that its highly speculative account of the formation of the earth does not deserve. 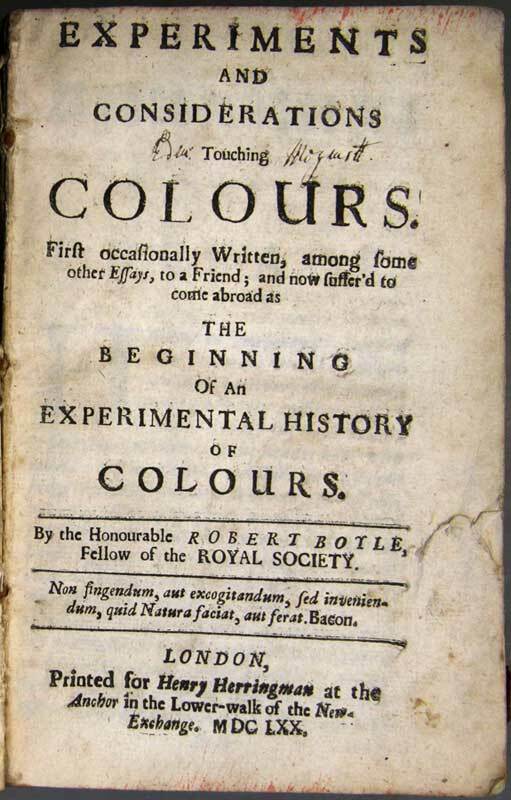 Robert Boyle, Experiments and Considerations Touching Colours. London: Printed for Henry Herringman, 1670. Private Collection. Boyle’s work on colours is part of his larger program to write natural histories of all the qualities of bodies. These histories were to be modeled on the method of natural history developed by Francis Bacon, and a passage from Bacon is used as the epigraph on the title page of this work. 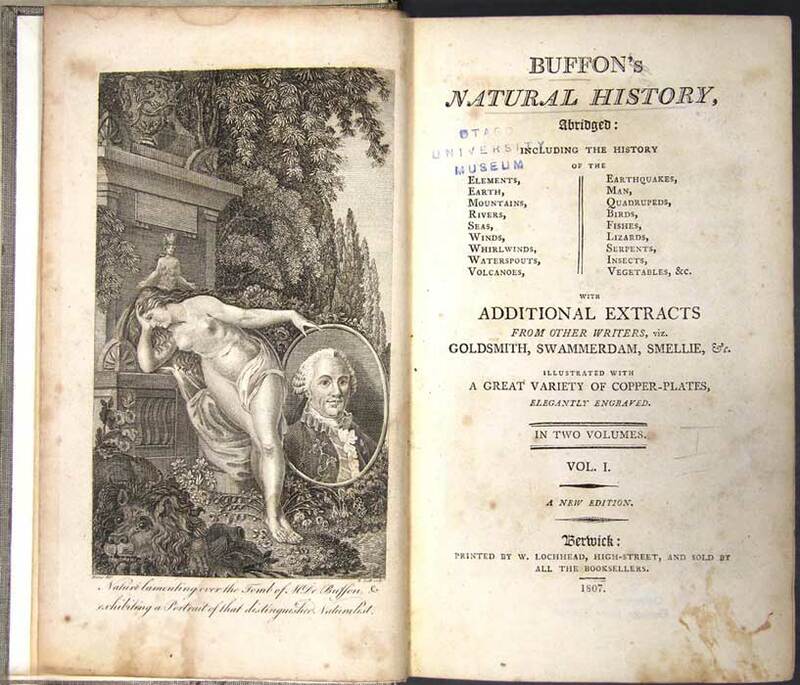 Boyle also wrote Baconian natural histories of cold, the air, human blood and mineral waters. In its day, Colours was an influential work. 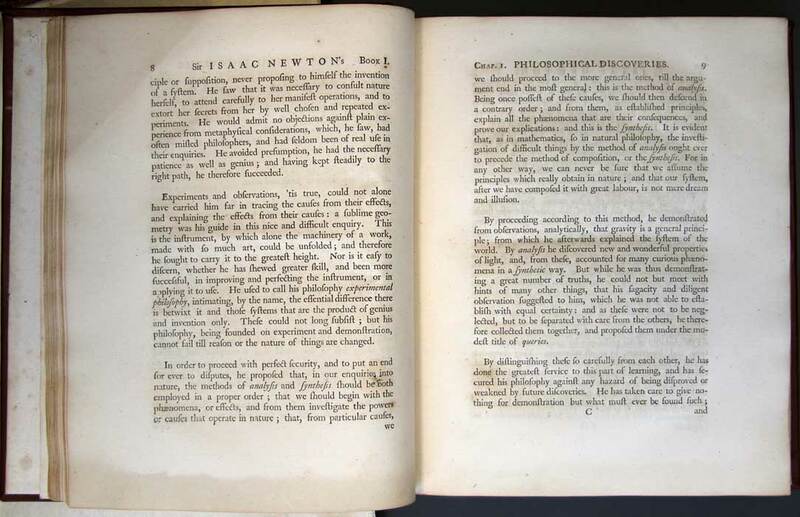 It was read by the young Isaac Newton in Cambridge and was a major stimulus to his work on optics. 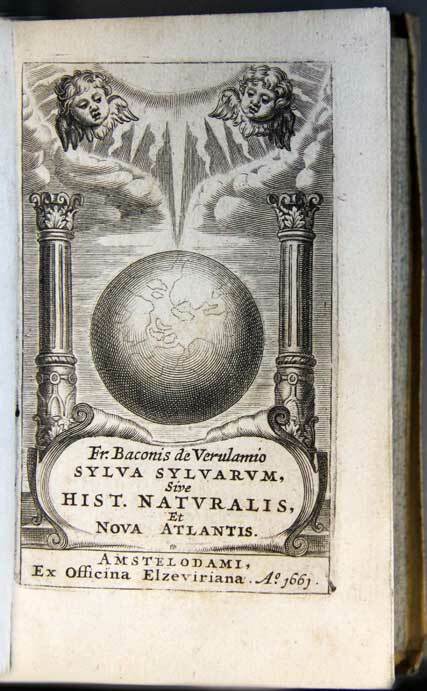 Bacon’s posthumous Sylva Sylvarum was his most popular work in the 17th century. It was re-issued 15 times and translated into Latin and French. By contrast the Novum Organum was re-issued only four times. 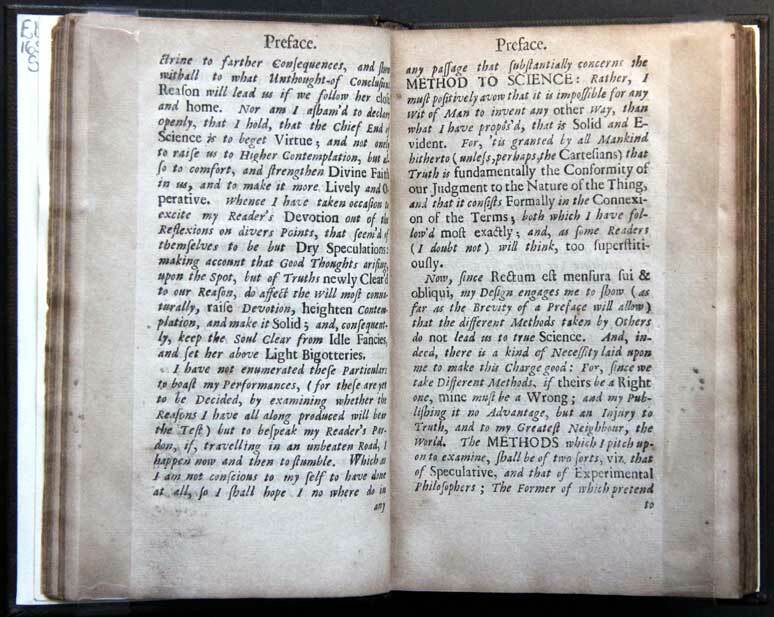 The work contains 1000 experiments and observations, which are carried out according to the philosophy of experiment that Bacon lays out in his De augmentis scientiarum (1623). 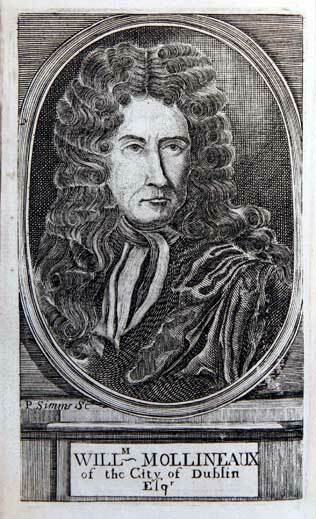 Robert Boyle considered his own Certain Physiological Essays to be a continuation of Bacon’s Sylva. John Locke owned three copies of the work and used it more heavily than any other work by Bacon. 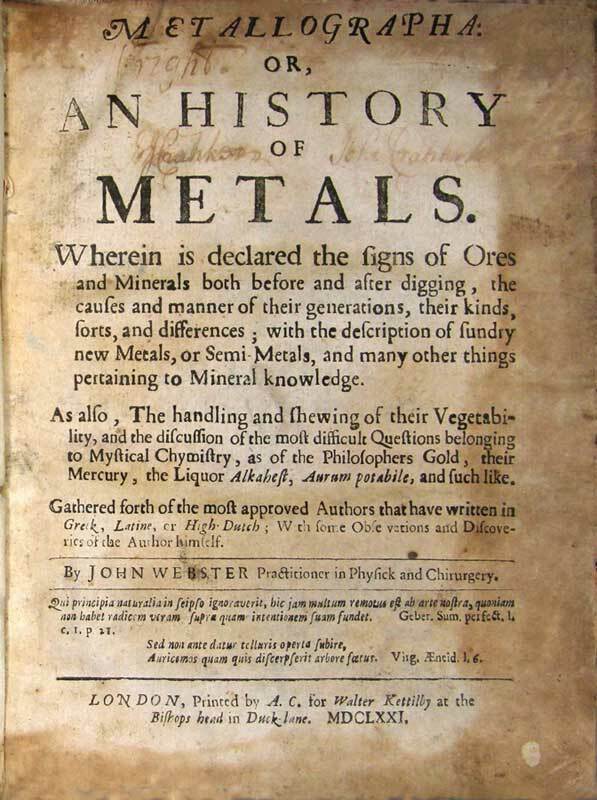 Webster’s History of Metals is another example of a natural history written according to the Baconian method. The study of geology was effectively inaugurated by Robert Boyle and Simon Stevin in the 1660s. It was quickly brought under the aegis of the natural historical method that prevailed in the early Royal Society. 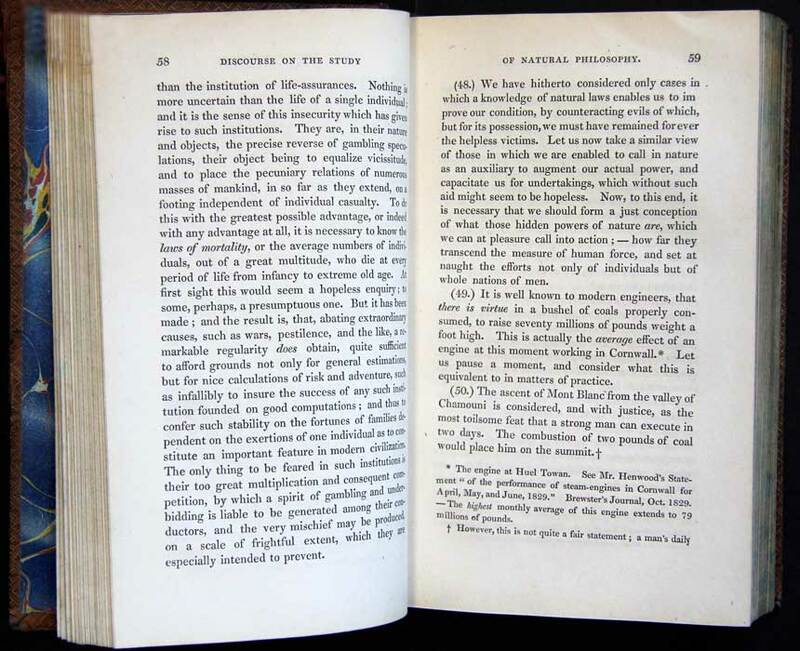 On page 26 displayed here, Webster distinguishes three kinds of writers about minerals: the speculative; the mystical and the ‘experimental Observators’. Needless to say, he recommends the latter. Buffon’s Natural History was a colossal achievement. 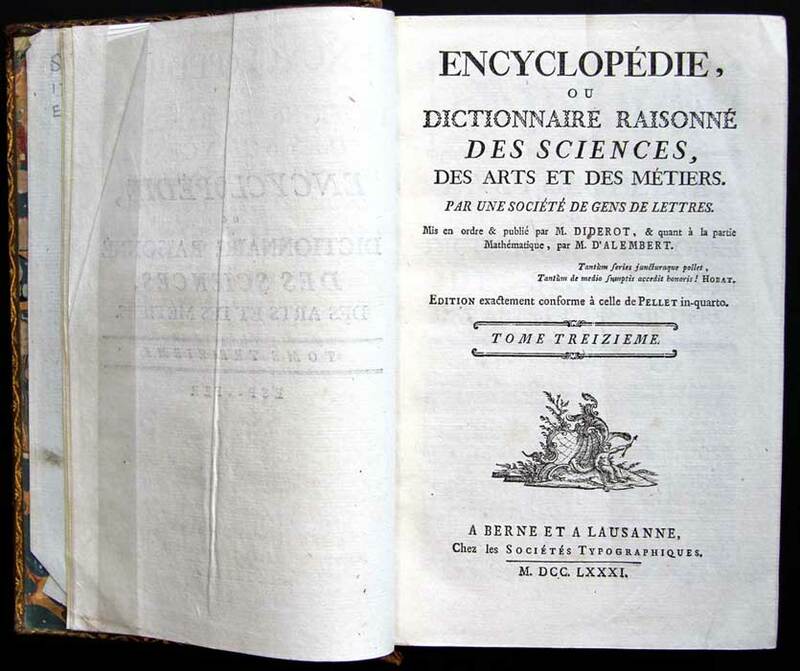 Comprising 36 volumes, its publication roughly coincided with that of Diderot and d’Alembert’s Encyclopedia. 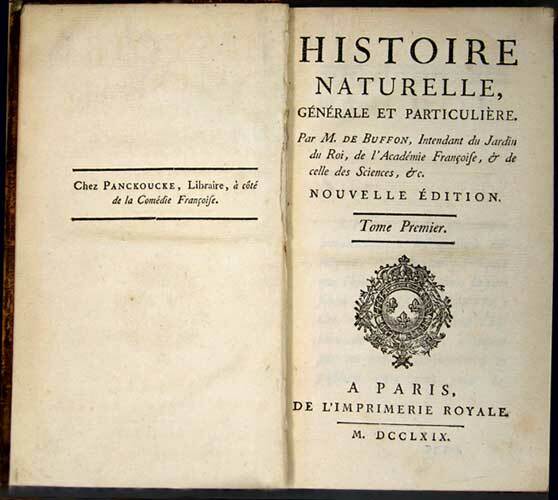 The Natural History is the high water mark of French natural historical writing in the early modern period. It does, however, bear little resemblance to earlier Baconian natural histories. The 18th century proved to be the heyday of natural history. The title Bradley’s Philosophical Account nicely illustrates the manner in which philosophy was still intimately tied to science in the early 18th century. 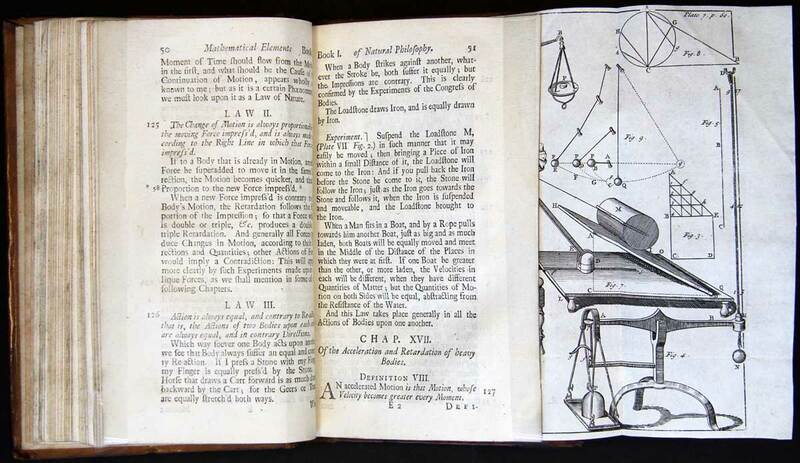 One of the ‘subscribers’ of the book was Isaac Newton, who paid for the printing of six copies. He was opposed to the dominance of natural history in the study of nature, but did not reject it outright. Bradley’s view of the understanding is that it is largely a product of nurture not nature. 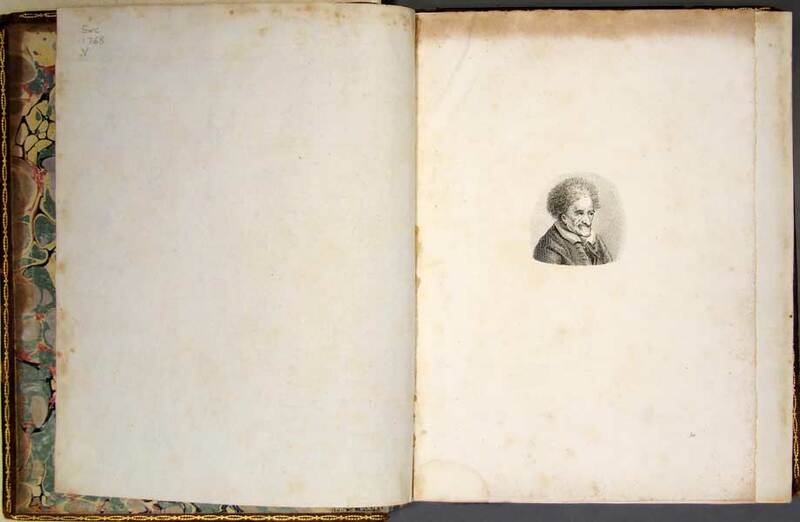 This popular abridgment of Buffon’s Natural History is stripped of all the ‘plainly ill-founded and fanciful’ of his theories (p. ix) and it is augmented with material from other authors. Its publication is testament to the public’s appetite for natural historical works. The page displayed refers to William Cheselden’s cataract operation on a teenage boy that was widely discussed in so far as it bore on the Molyneux Problem (see Cabinet 18). 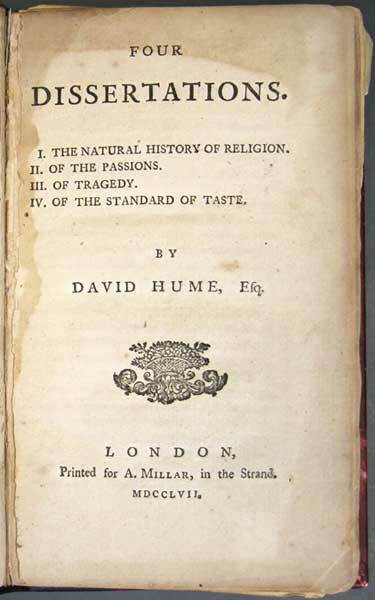 David Hume felt that his first book, A Treatise of Human Nature (1739–1740), had failed to gain success ‘more from the manner than the matter’, so he separated and rewrote the three parts of the book ten years later. 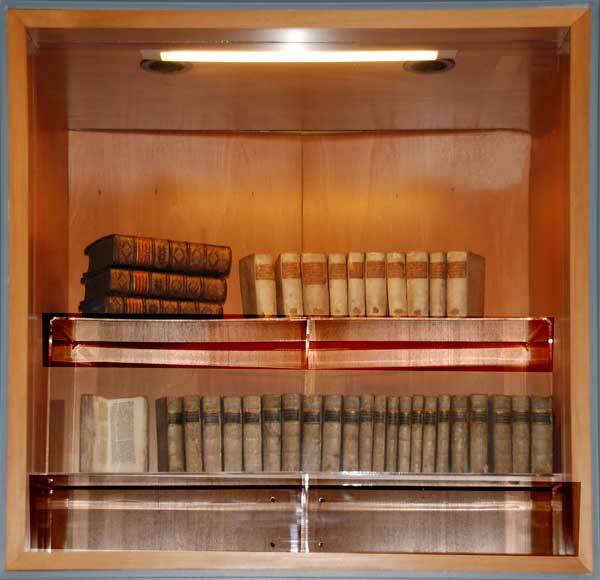 The Essays and Enquiry displayed here correspond to the first and third parts of the Treatise respectively. 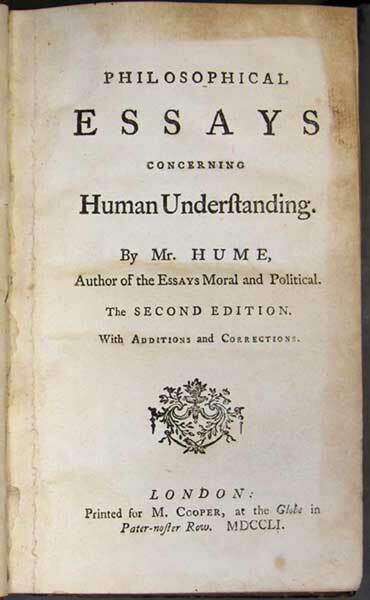 Hume may have changed his writing style, but he retained the Treatise’s emphasis on the importance of the experimental method and continued to insist that we should apply it in all of our enquiries, whether in natural or moral philosophy. Usually regarded as the father of economics, Adam Smith was in fact Professor of Moral Philosophy at the University of Glasgow. 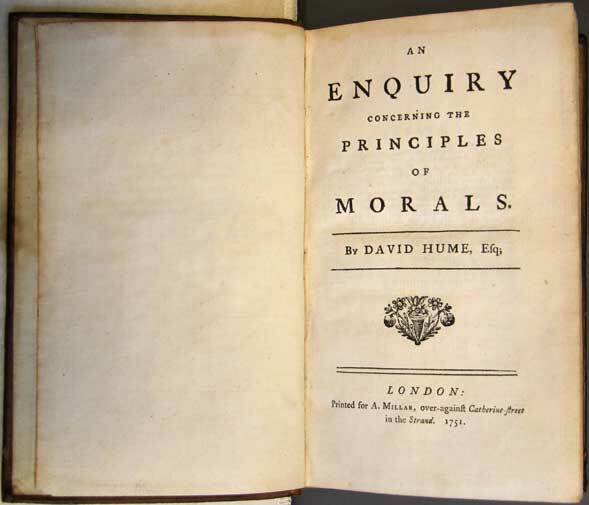 He was a close friend of David Hume, with whom he shared the emphasis on experience and observation as the source of the ‘general maxims of morality’. In this passage Smith tells us that the rules of morality are found by the method of induction from experience. This collection of essays contains Hume’s most extensive treatment of what we now call ‘aesthetics’. The essays ‘Of Tragedy’ and ‘Of the Standard of Taste’ focus specifically on our experience with works of art. 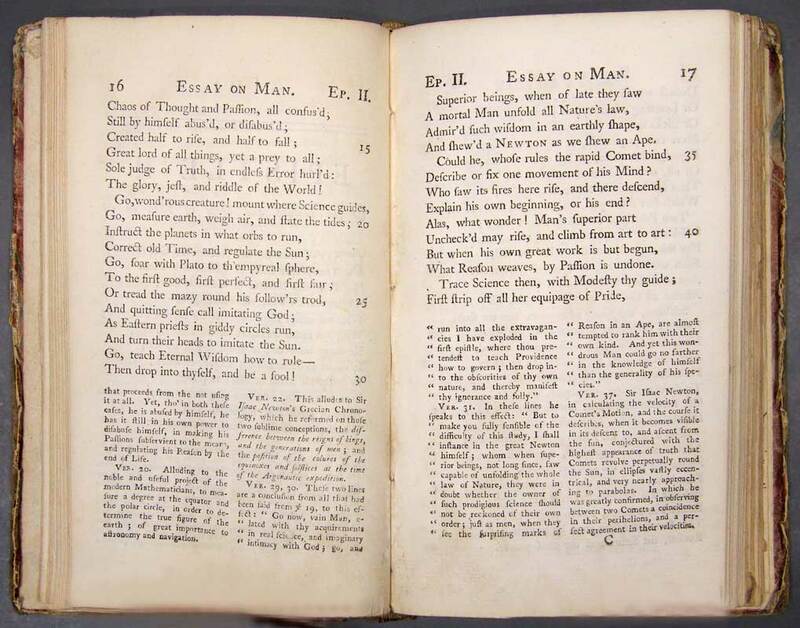 Just like the rules of morality, the rules of art or composition, according to Hume, are also found by following the experimental method used in ‘all the practical sciences’. Voltaire’s Letters concerning the English Nation were enormously popular in England and France. 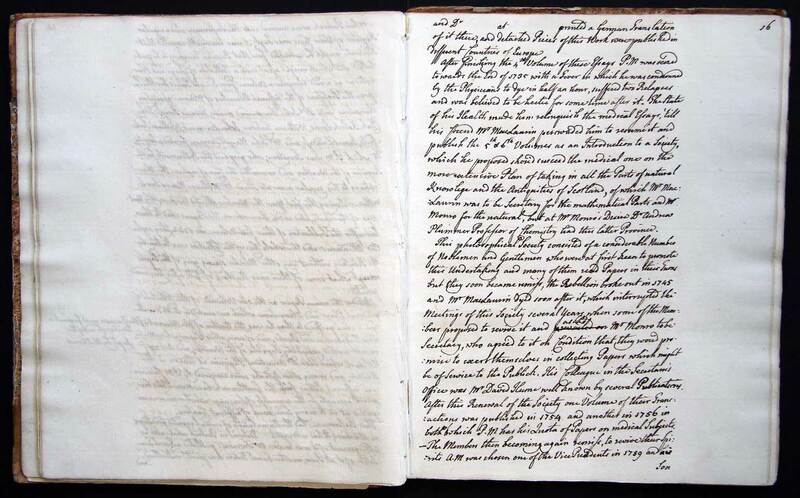 They derive from observations made during Voltaire’s sojourn in England from 1726–8. 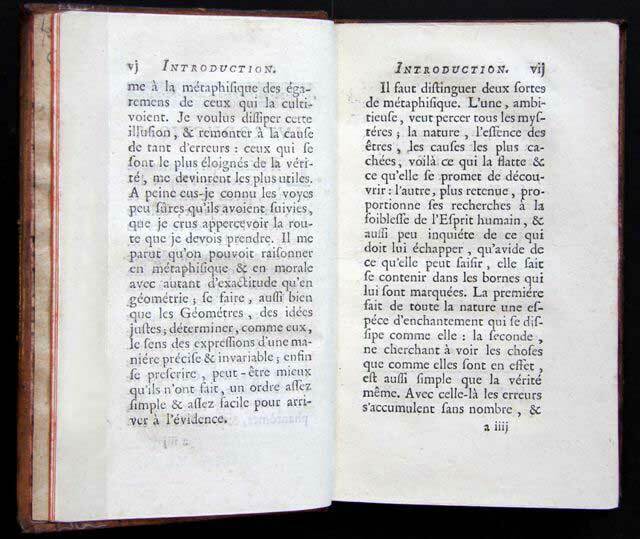 First published in English, it was long believed that Voltaire actually wrote them in English and subsequently translated them into French. Recent scholarship, however, has shown definitively that they were translated from the French by John Lockman. The letter displayed here contains a witty and penetrating summary of the transition from the dominance of Descartes’ vortex theory of the cosmos to Newton’s account of the solar system: ‘A Frenchman who arrives in London, will find Philosophy, like everything else, very much chang’d there. He left the world a plenum, and he now finds it a vacuum’. 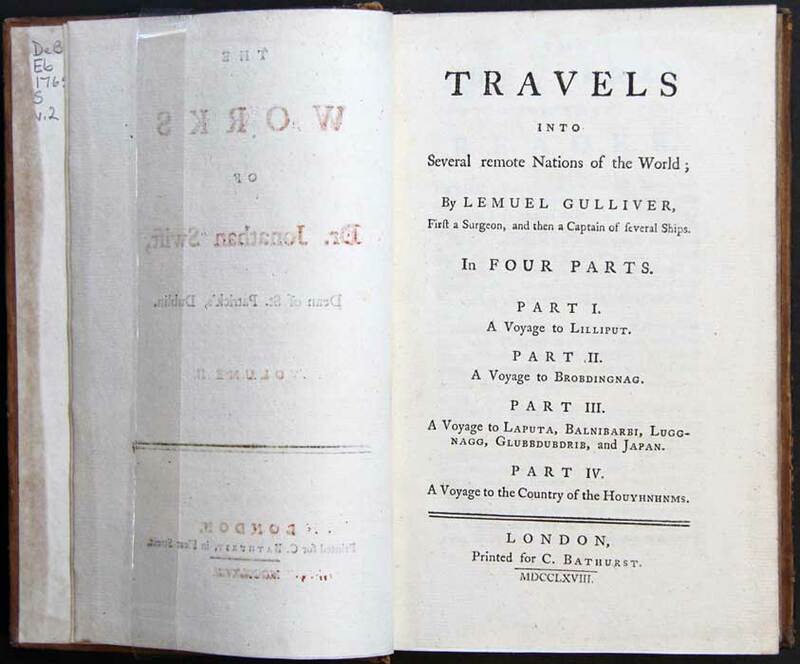 Popularly known as Gulliver’s Travels, Swift’s novel contains a wonderfully satirical treatment of the Royal Society. One common criticism of the experimental philosophy concerned the preoccupation of its adherents with experiments and collecting that were of little value and produced nothing useful. On visiting the Academy of Lagado, Gulliver finds a natural philosopher who ‘had been eight years upon a project for extracting sun-beams out of cucumbers’ which would be bottled and released to warm the air in inclement summers! Nicholas Robinson completed his M.D. at Rheims in 1718. He then moved to London to work under Richard Mead, Fellow of the Royal Society, to whom he dedicated the book displayed here. 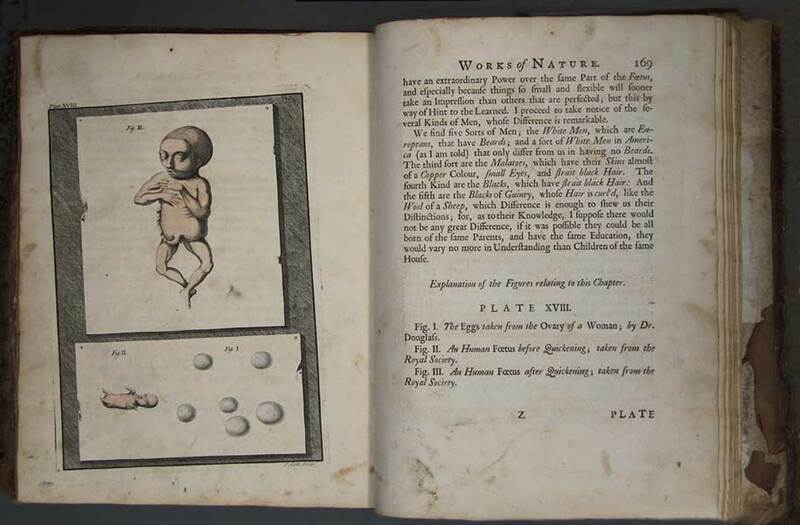 As the title page shows, he, like many physicians of the day, sought to apply Isaac Newton’s method to medicine. 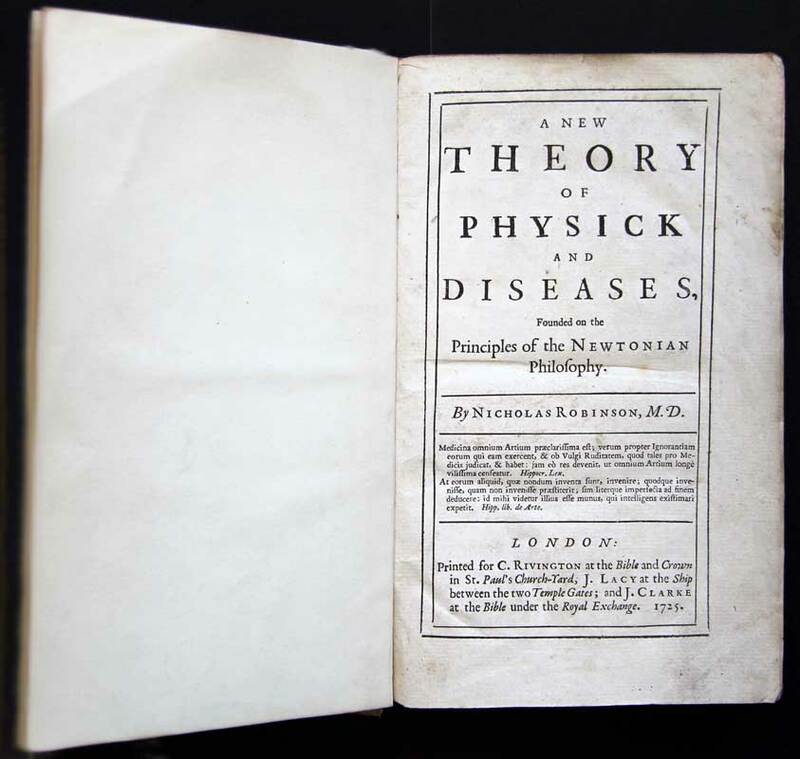 Of course, from the 1650s physicians had championed a general experimental method in medicine, but after the publication of Newton’s Principia many thought that Newton had now provided the real key to unlocking the secrets of the human body. Jean-Baptiste Senac studied in Leiden and London, two of the leading centres for the study of medicine in the first decades of the 18th century. In London he came under the influence of John Friend, who was a disciple of Newton. 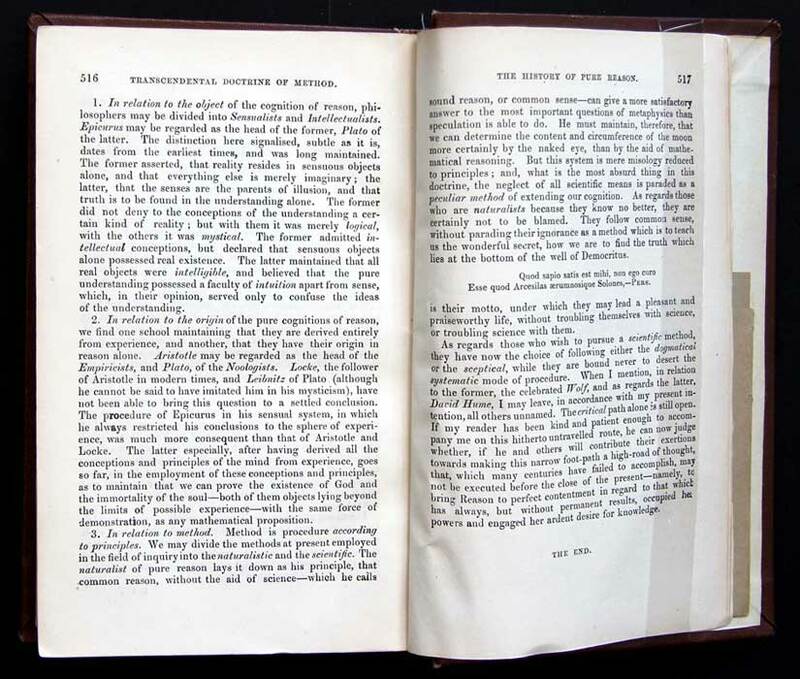 In the preface to his influential treatise of the structure of the heart, Senac expresses the anti-hypothetical stance typical of the experimental philosophy and calls for the application of geometry in the practice of medicine. The first of the famous medical dynasty of the University of Edinburgh, Alexander Monro Primus studied at Leiden and London. He then moved back to Edinburgh and with the help of his colleagues and friends built the reputation of the Medical School, which came to be regarded as a leading centre among the universities of Europe. He was a close friend of Colin MacLaurin, and both of them were founding members of the Philosophical Society that would become the Royal Society of Edinburgh. There he served as secretary for a period of time, alongside another famous promoter of experimental philosophy, David Hume. This passage of Monro’s autobiography gives a brief sketch of the early history of the Society, mentioning both MacLaurin and Hume. The French philosophes were keen promoters of the experimental philosophy in the mid-eighteenth century. 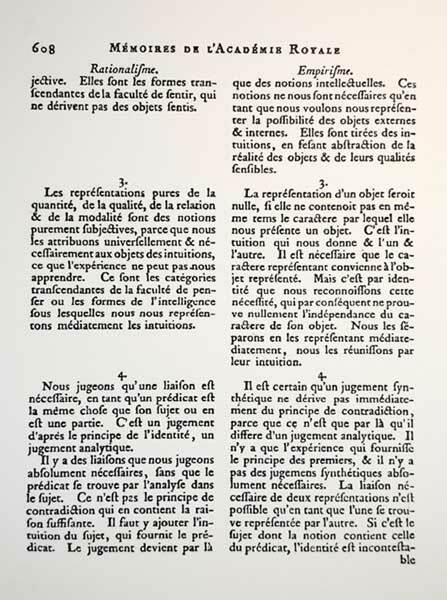 Condillac denounced speculative systems in his Traité des systèmes and developed a Lockean theory of ideas in his Essai sur L’Origine des Connoissances (on display here). 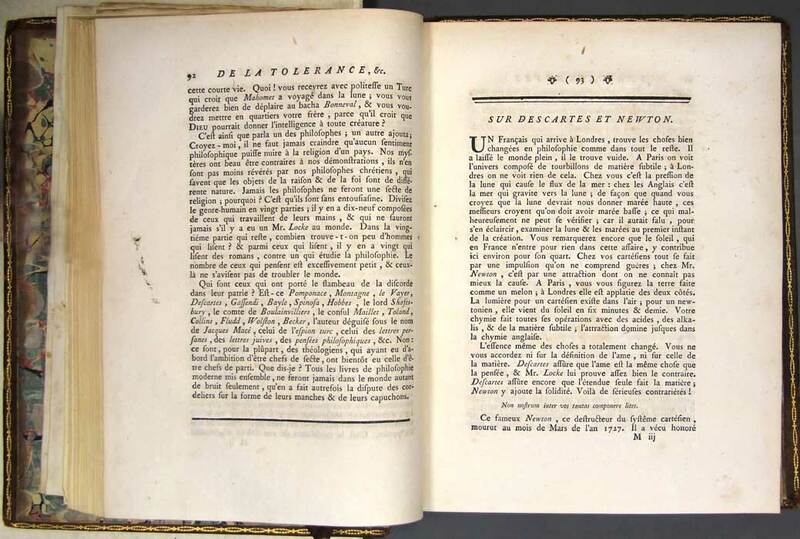 Jean Le Rond d’Alembert’s ‘Preliminary Discourse’ to the famous Encyclopédie gives a brief history of experimental natural philosophy, tracing its origins from Bacon to Newton. In contrast to the British histories of the experimental philosophy, Descartes is given a prominent place in the emergence of experimental philosophy. Suppose a man born blind is given a brass cube and a brass sphere of roughly the same size and that he can distinguish them by touch. If the blind man miraculously received his sight, would he be able immediately to distinguish between them and could he say which is the cube and which is the sphere by vision alone? This problem has been called the central question of 18th century epistemology and psychology. It was first discussed by John Locke, then by Leibniz, George Berkeley, Thomas Reid, and by many great philosophers down to the end of the twentieth century. None of these philosophers were able to solve the problem. The problem was finally solved not by philosophers at all, but by developmental psychologists in a series of studies from 1979 to 1993. The Molyneux Problem is a classic example of a problem that is conceived by philosophers, but solved by scientists. 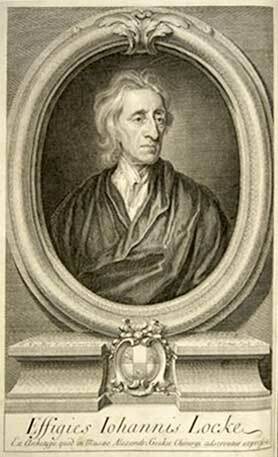 Locke was the first philosopher to discuss the Molyneux Problem. He claims in his Essay that the newly sighted man would not be able to distinguish the cube and sphere immediately, because he would have to learn how to correlate ideas from his newly acquired sense of vision with those derived from his sense of touch. George Berkeley, who discussed the problem in his Essay towards a New Theory of Vision (1709) also denies that the newly sighted man can distinguish the sphere and cube. 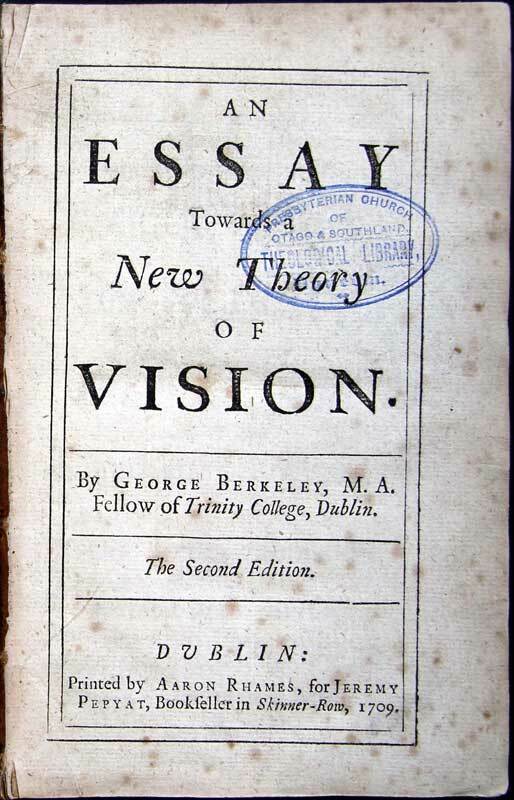 It is almost certain that this copy of George Berkeley’s An Essay towards a New Theory of Vision belonged to the philosopher David Hume. This discovery was made while this exhibition was being assembled. 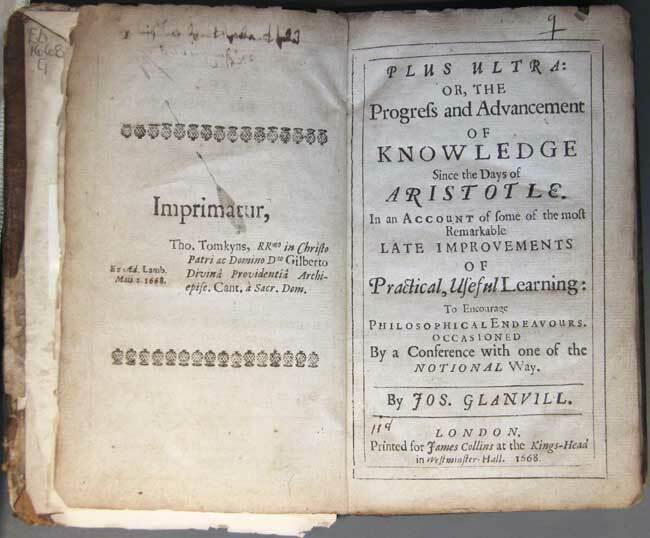 It has long been known that this book was in the library of Hume’s nephew Baron David Hume, but until now its whereabouts have been unknown. 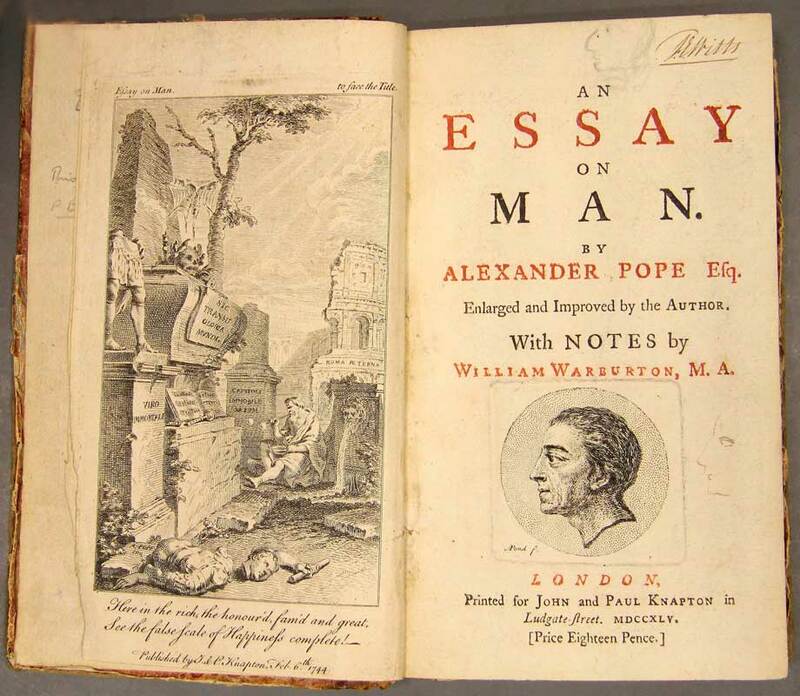 The provenance of the book provides important additional evidence that Hume was familiar with Berkeley’s writings, something that was denied by the historian of philosophy Richard Popkin in 1959. Popkin claimed that ‘there is no actual evidence that Hume was seriously concerned about Berkeley’s views’. He was subsequently proven wrong. 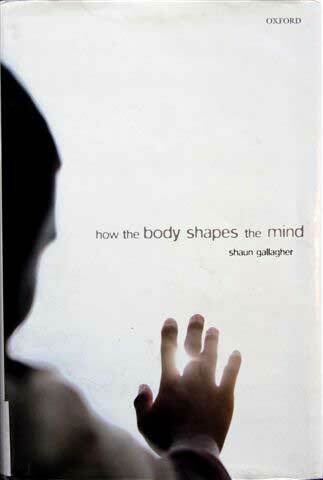 Shaun Gallagher was one of the first philosophers to review the late 20th century empirical work that bore on the Molyneux Problem. He reproduces here cross-sections of the dummies (pacifiers) that were used by Meltzoff and Borton in their famous 1979 study of neonates’ abilities to correlate different sensory modalities. This was the first of a series of experiments that provided the answer to the Molyneux Problem. Gareth Evans’ thorough discussion of the Molyneux Problem provides a very helpful review of the major lines of approach that philosophers have taken to the problem since Locke. Interestingly, he recommends that the central issue can best be drawn out by replacing the sphere and cube with a circle and square. Unfortunately, however, Evans failed to consult the recent empirical work on neonates by Meltzoff and Borton (Nature, 282,1979), which had already established that humans are able to correlate different sensory modalities from birth. Evans’ paper is a nice example of armchair analytic philosophy that had already been superseded by empirical science by the time it was written. 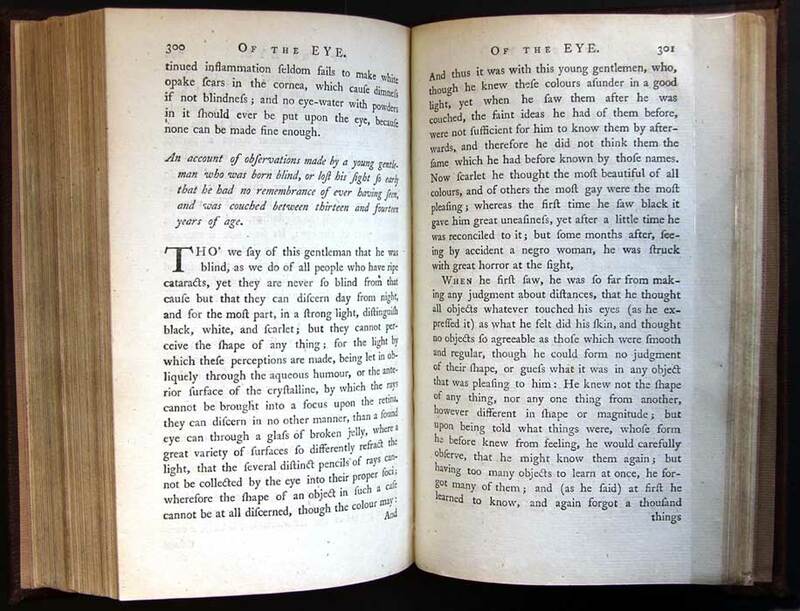 William Cheselden’s famous cataract operation on a boy of 13 or 14 years, which originally appeared in the Philosophical Transactions of 1728, provided the first serious empirical evidence that bore directly on the Molyneux Problem. 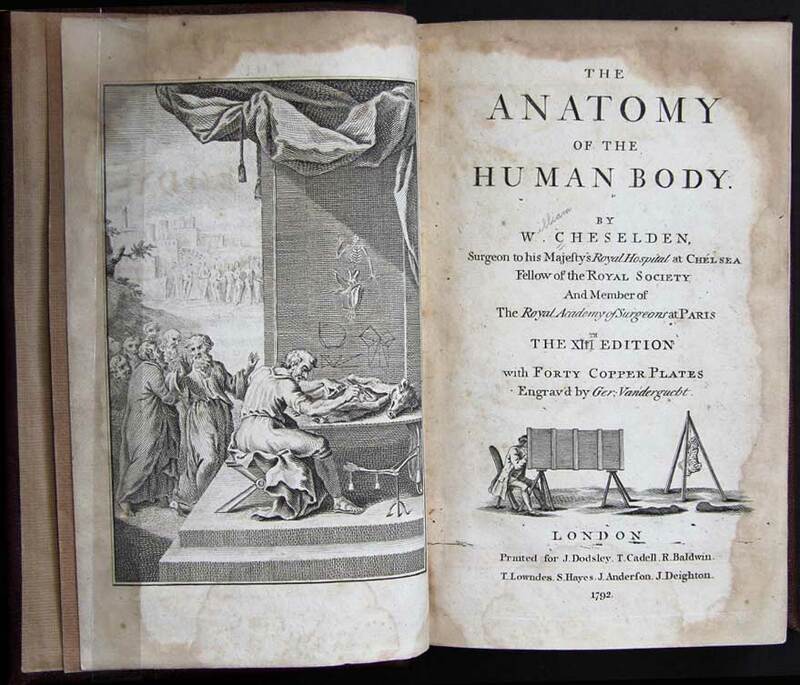 The report is reproduced here in his important work on human anatomy. George Berkeley claimed that Cheselden’s report was direct confirmation of his own theory of vision. Cheselden, however, appears not to have been aware of the problem and neither alludes to Molyneux, Locke or Berkeley. 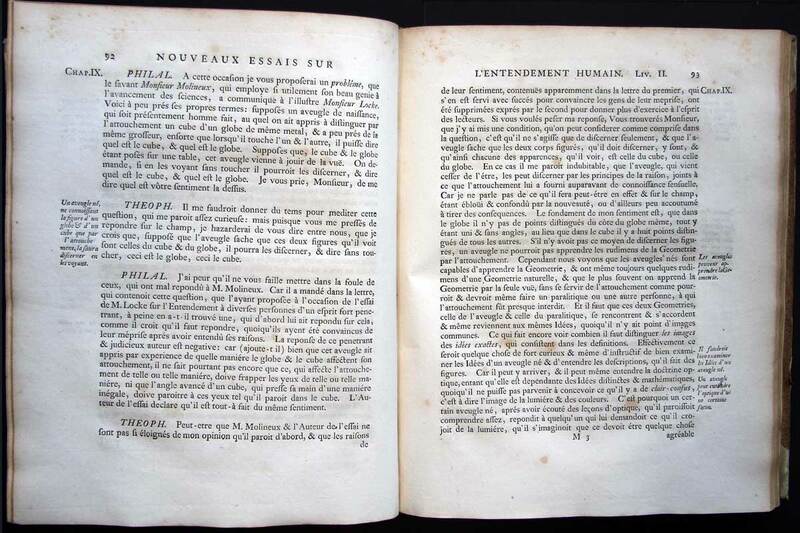 The title of Herschel’s work on the method of natural philosophy alludes to the ‘Preliminary Discourse’ of the French Encyclopédie, but the content of the work shows few continuities with the methodological writings of the mid-18th century. The term ‘speculative philosophy’ is still in use, but it is not set within the context of the distinction between experimental and speculative philosophy. 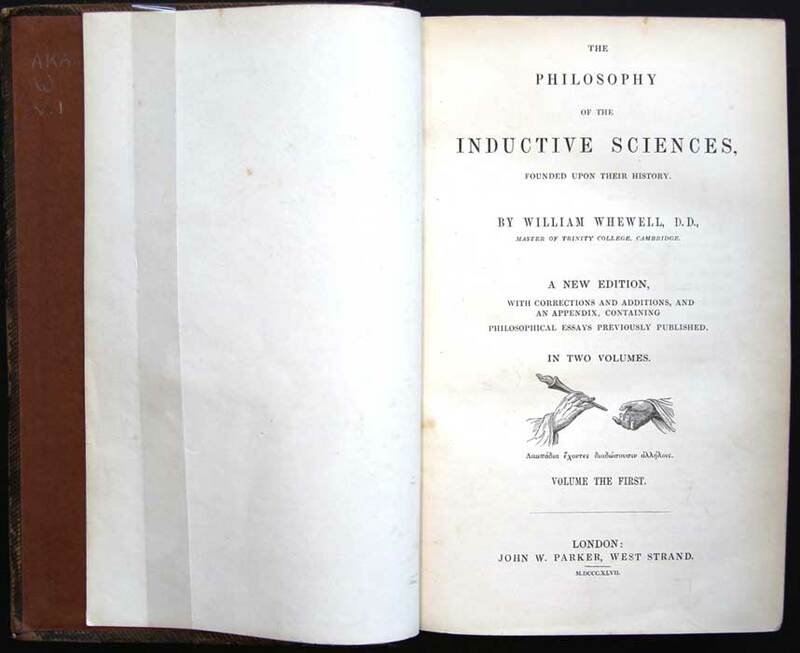 By the time of William Whewell’s The Philosophy of the Inductive Sciences, the term ‘natural philosopher’ had all but disappeared and the term ‘scientist’ was now in use. Disciplinary boundaries had shifted and the division between science and philosophy was closer that what it is today. Unlike those in the 17th and 18th centuries, Whewell claims that the decisive legacy of Francis Bacon was his inductive method. Moreover, unlike his forebears, Whewell argues for a positive role for hypotheses in science. Philosophers in early modern Germany did not distinguish between empiricism and rationalism, but between experimental and speculative philosophy. 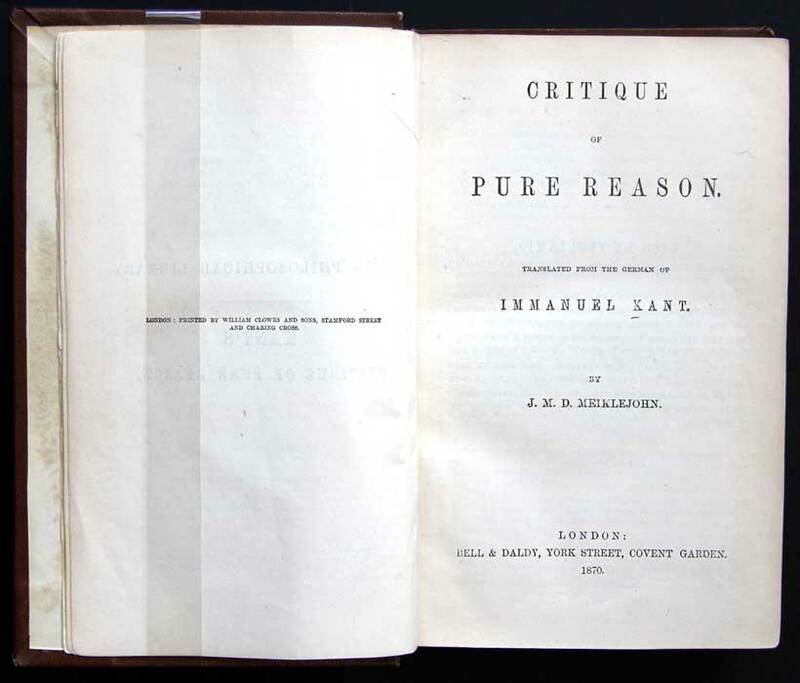 This changed after the publication of Kant’s Critique of Pure Reason in 1781. 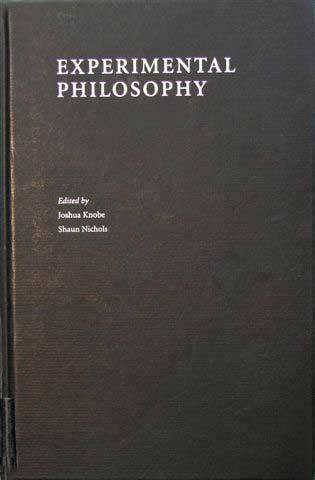 Kant contrasts Aristotle’s and Locke’s empiricism with Plato’s and Leibniz’s noologism (later called rationalism). Once Kant’s Lockean opponents reclaimed the name of empiricists, their polemics with Kantians found expression in lengthy tables comparing the merits of empiricism and rationalism. 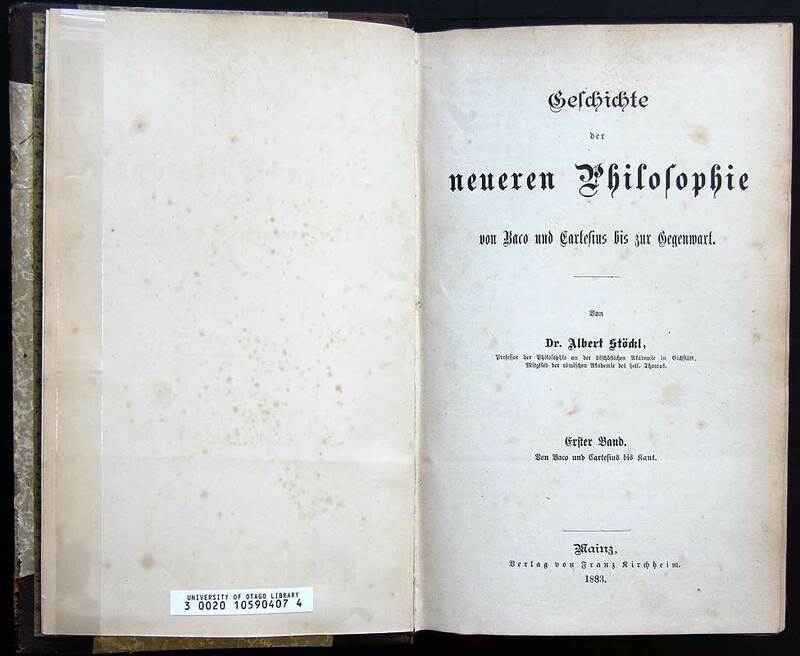 Nineteenth-century Germany witnessed a flurry of activity in the history of philosophy, with the publication of many histories such as Ueberweg’s, Fischer’s and Schwegler’s histories on display. 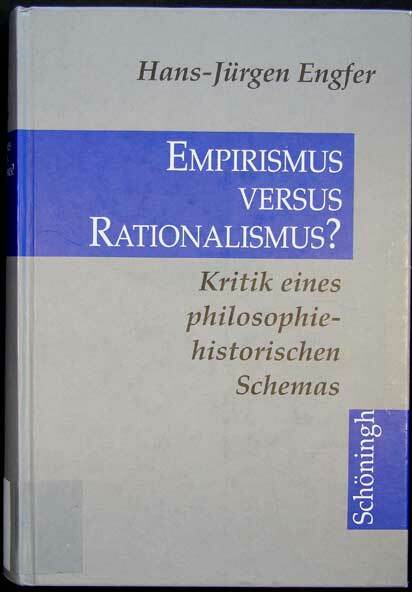 The contrast between rationalism and empiricism provided the terms of reference for their narrative of early modern philosophy. This can be seen from Stöckl’s History of Modern Philosophy, centred on the distinction between Baconian empiricism and Cartesian rationalism. By the time Stöckl’s history was published, the early modern notion of experimental philosophy had fallen into oblivion. 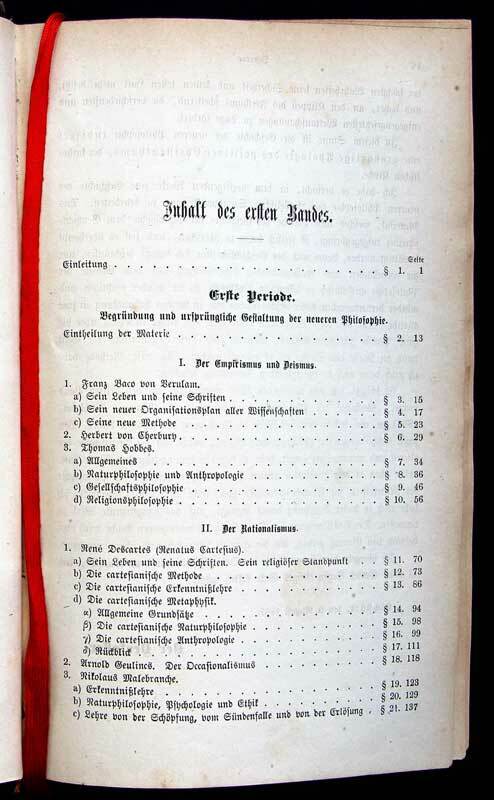 In the English-speaking world, the distinction between empiricism and rationalism became ubiquitous at the turn of the 20th century, when it was adopted by a large number of university manuals. 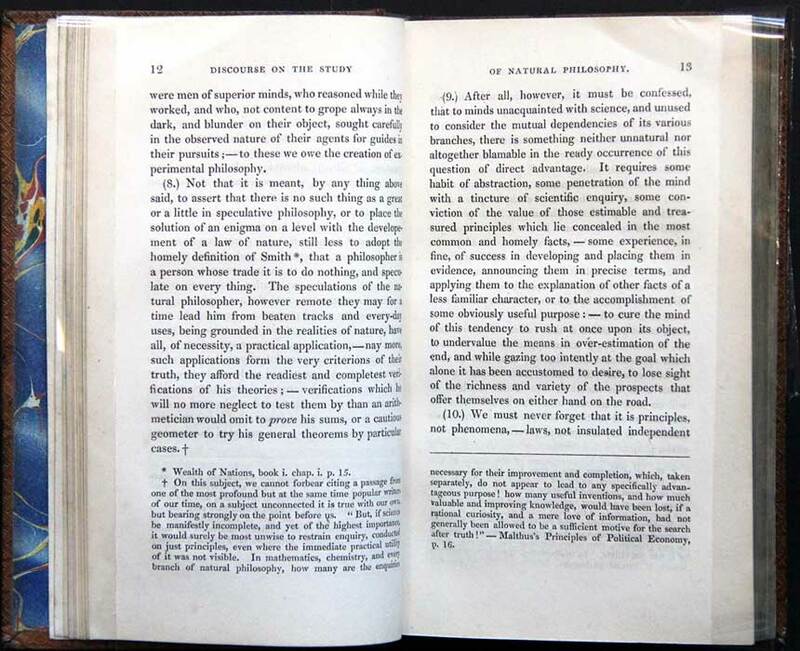 For instance, according to Hibben’s Problems of Philosophy (1898), ‘the distinction between rationalism and empiricism marks one of the chief points of difference between the continental and British philosophers. Of the rationalistic school we have Descartes, Spinoza, and Leibniz as the chief representatives, while of the school of Empiricism are found Locke, Hume, and John Stuart Mill’. 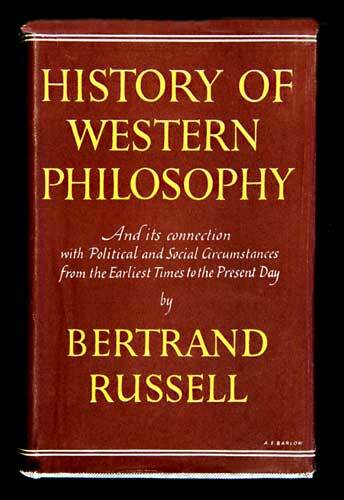 Russell wrote his History of Western Philosophy hastily out of financial desperation at the beginning of World War II, when he was jobless in New York. 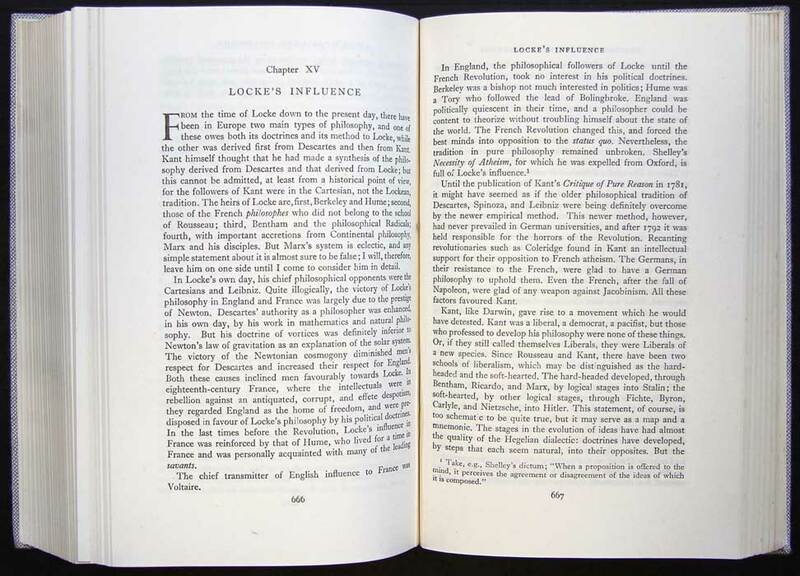 Discussing Locke’s influence, Russell describes a British empiricist ‘type of philosophy’ that ‘owes both its doctrines and its method from Locke’. ‘The heirs of Locke are, first, Berkeley and Hume’. The extraordinary success of Russell’s book, which incidentally, won the Nobel Prize for Literature, perpetuated what John Fate Norton aptly named ‘the myth of British empiricism’. 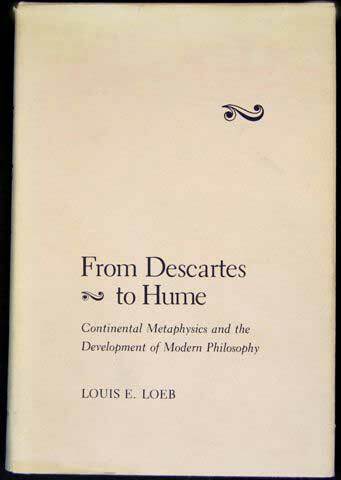 Louis Loeb, From Descartes to Hume. Ithaca, New York: Cornell University Press, 1981. Private Collection. Hans-Jürgen Engfer, Empirismus versus Rationalismus? Paderborn: Ferdinand Schöningh, 1996. Central B816 .EK1. Image used with kind permission from Ferdinand Schöningh GmbH & Co. Since the early 1980s, a growing number of historians have become sceptical of the standard narrative of early modern philosophy based upon the dichotomy of empiricism and rationalism. Louis Loeb was among the first to mount a large-scale frontal attack on the standard narrative in his monograph From Descartes to Hume (1981). Fifteen years later, Hans-Jürgen Engfer gathered an extensive amount of evidence against the standard narrative in his Empirismus versus Rationalismus? (1996). However, no alternative account has yet gained currency as the basis for a new history of early modern philosophy. Bas van Fraassen, The Empirical Stance. New Haven: Yale University Press, 2002. Private Collection. Image used with kind permission from Yale University Press. While historians were questioning the portrayal of Locke, Berkeley, and Hume as empiricists, philosophers started rethinking their commitment to empiricism. 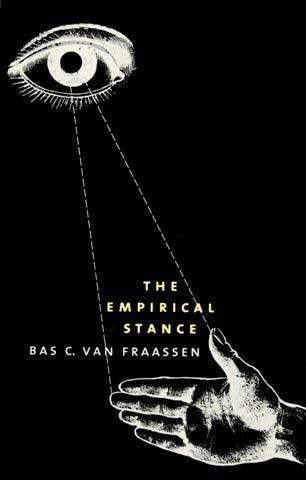 Bas van Fraassen characterizes empiricism as an empirical stance, a stance that takes science as a paradigm of rational inquiry. This stance is exemplified not only by Berkeley, Mach, and Duhem, but also by Leibniz – once thought a typical Continental rationalist. On the other hand, Locke’s empiricism was taken to rest on his attack on innate ideas, but Paul Carruthers argues that empiricists should be innatists. With so many divergent empiricisms and categorizations of empiricists, is the very notion of empiricism still useful in the historiography of philosophy? 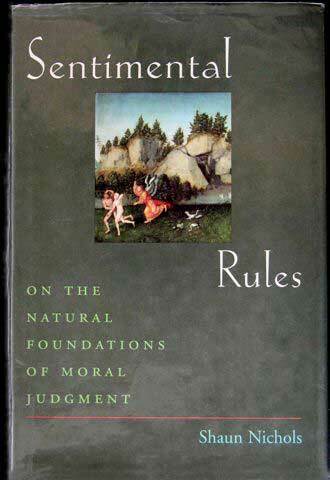 Nichols’ Sentimental Rules provides an account of the psychological mechanisms responsible for moral judgment as well as a defence of moral relativism. 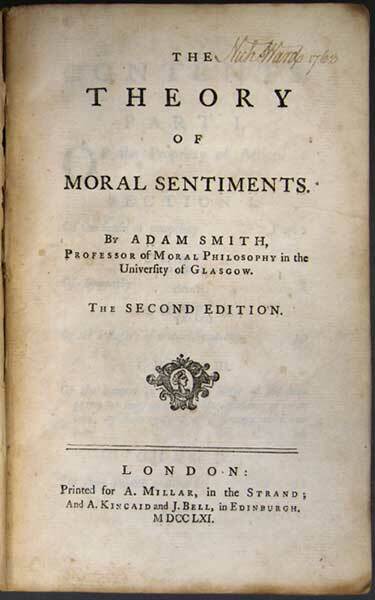 Against moral rationalism inspired by Ralph Cudworth and Kant, Nichols’ emotivism relates the capacity for moral judgment to the capacity to judge the appropriateness of a feeling of guilt. Nichols tackles at once empirical and meta-ethical questions, drawing heavily on the results of experiments with psychopaths, young children, and even his own students. The ‘new’ experimental philosophy that emerged in the last decade addresses philosophical questions on the basis of empirical data. This is a feature of many recent studies that are not advertised as works of experimental philosophy. For instance, Flanagan’s Varieties of Moral Personality draws on a wealth of empirical data, including discussions of secular saints, non-monogamous marriage practices, and Buddhist lifestyles. 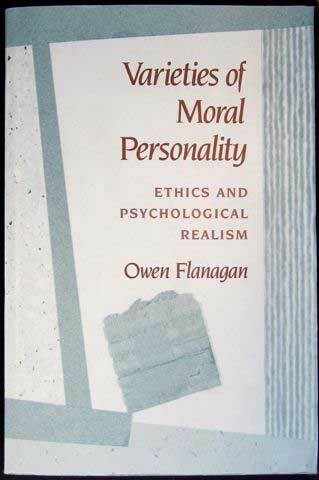 Flanagan’s conclusion is a philosophical one: given the variety of human psychology, no single set of moral duties and requirements defines a standard of moral excellence applicable to all human beings. 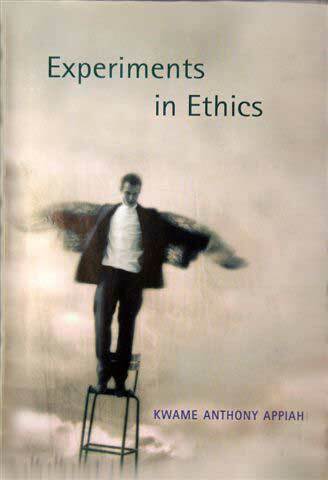 This collection of influential and new papers provides an overview of the burgeoning field of experimental philosophy. Many articles start by reporting the percentages of ordinary people who hold various sorts of intuitions, from the semantics of proper names to whether one can be morally responsible in a universe determined by the laws of nature. Does knowledge of this data enable philosophers to settle questions that were traditionally discussed from the armchair? 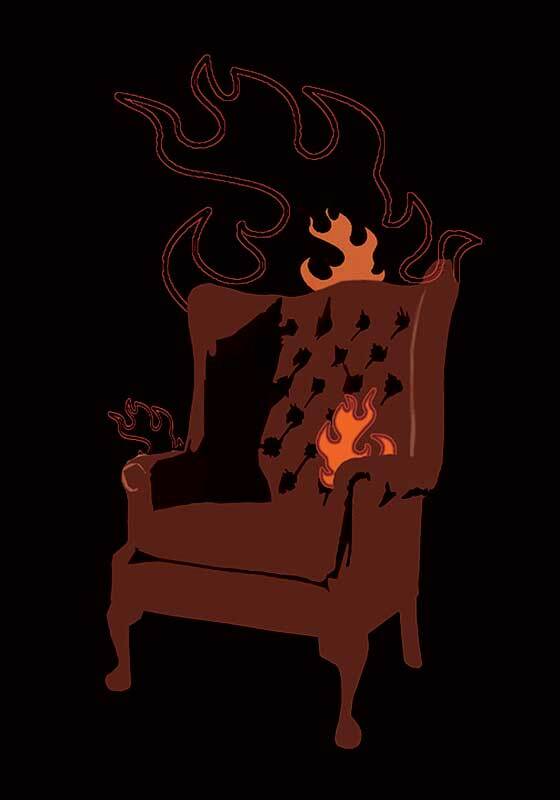 Whether experimental philosophers are really setting ablaze the proverbial armchair is a hotly debated topic. Kwame Anthony Appiah, Experiments in Ethics. Cambridge, Mass.,: Harvard University Press, 2008. Bioethics Centre Library. Appiah argues that the wealth of empirical research on people’s intuitions and psychology demands the attention of moral philosophers. Take moral character for example. How can it be the basis for moral action, if much empirical research has shown that our behaviour is largely determined by the situations we are in? Appiah takes himself to be reviving an empirical approach pursued by classical philosophers like Hume: ‘What’s novel is not the experimental turn; what’s novel was the turn away from it’. 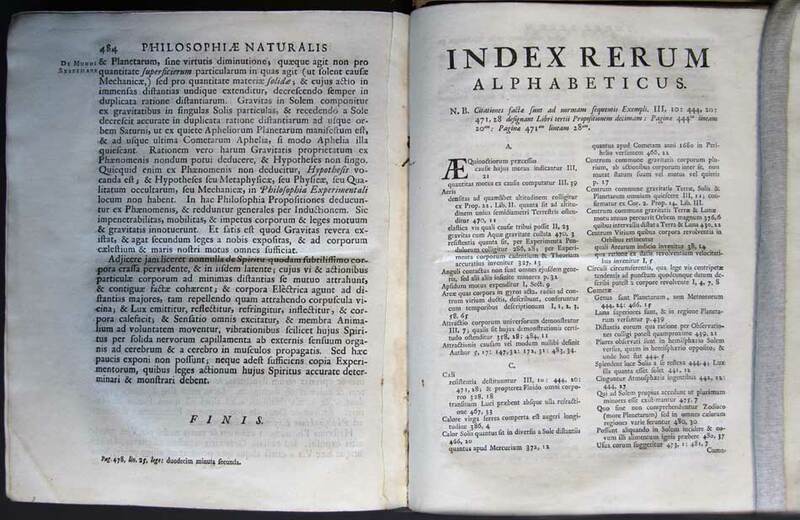 The emergence of the experimental philosophy coincided with the publication of the first journals in natural philosophy. 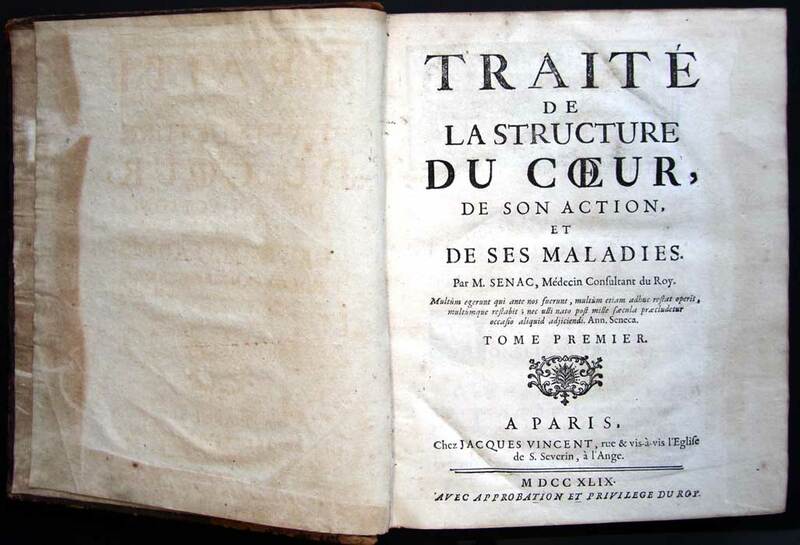 The Journal des sçavans of the Parisian Académie des Sciences was first published in January 1665. In its early years it functioned largely as a review journal. 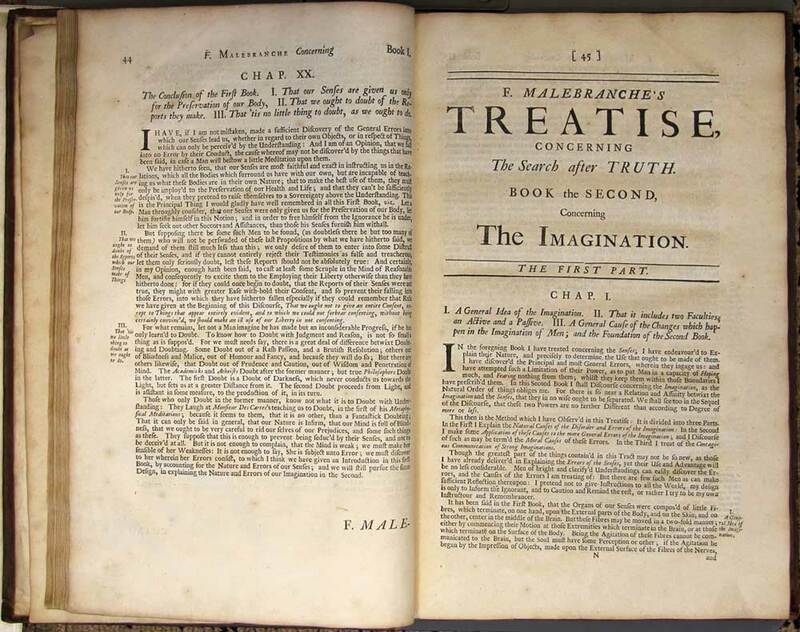 The Philosophical Transactions of the Royal Society commenced in March 1665. It served to disseminate experimental and observational reports as well as reviews of recent books. It is still being published today. 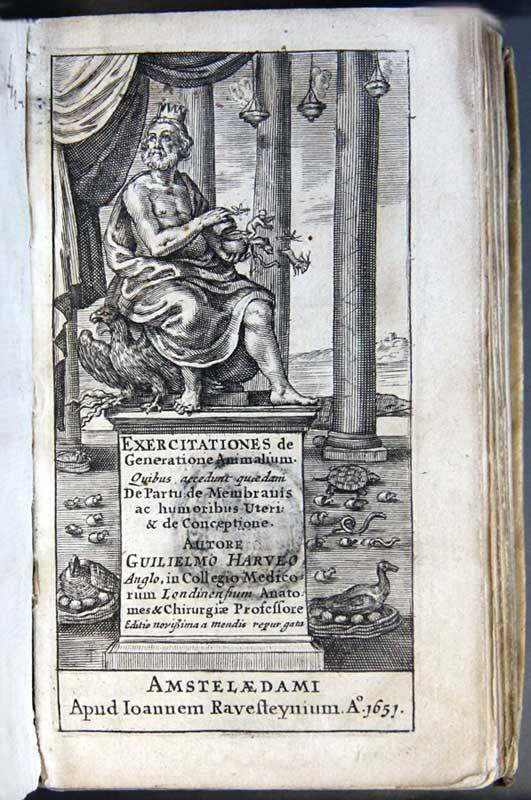 The Bibliothèque universelle et historique was edited by Jean Le Clerc and published in The Netherlands. It was a review journal covering natural philosophy, literature and theology. 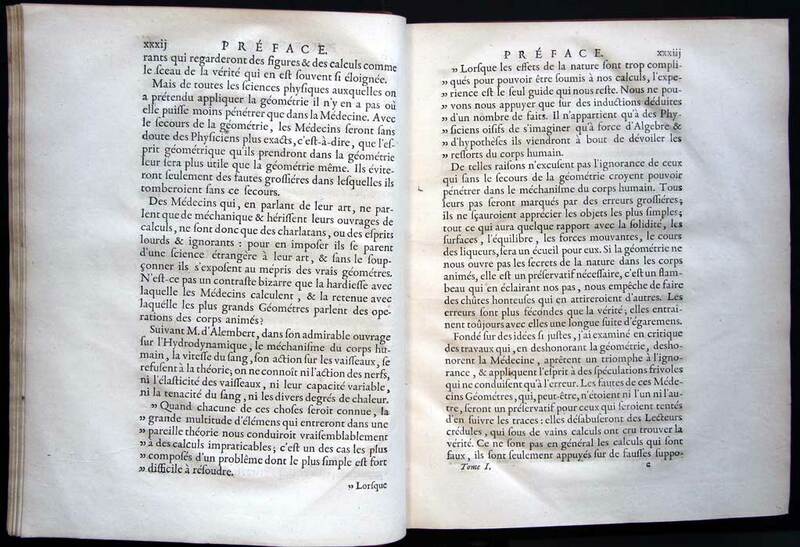 The first French review of Newton’s Principia (1687) by the philosopher John Locke in Tome VIII of the Bibliothèque universelle is displayed here. 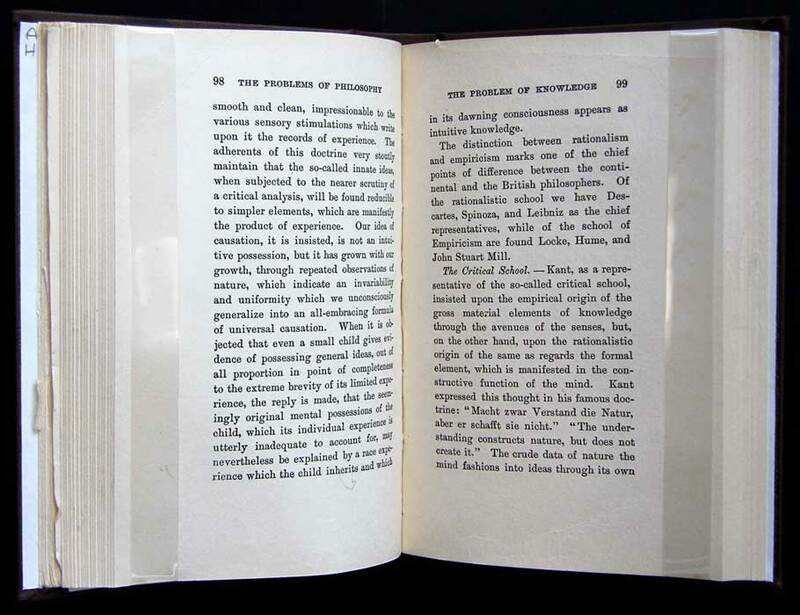 The first English language journal of philosophy and psychology was aptly called Mind. Issue number one is from 1876. The Australasian Journal of Psychology and Philosophy commenced in 1923 and changed its name to the Australasian Journal of Philosophy in 1947. 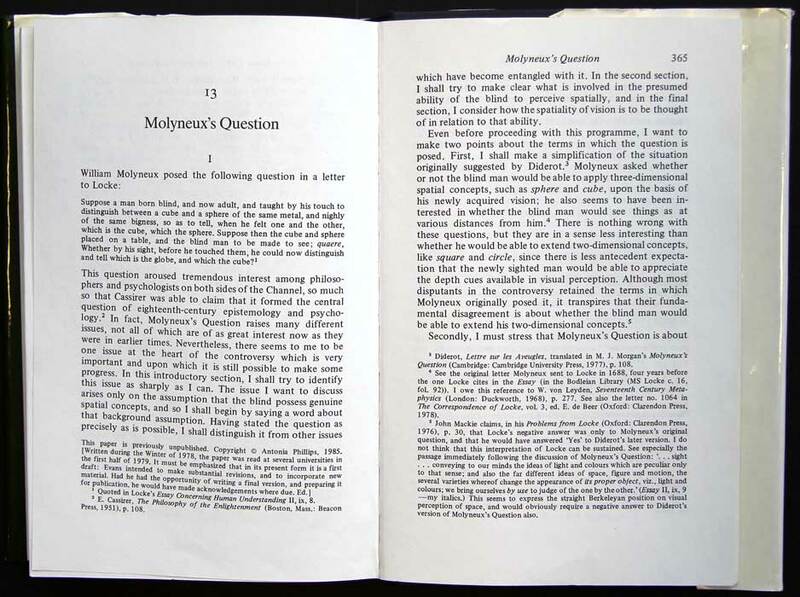 The first issue of the new AJP contains an article by John Mackie who held the chair at the University of Otago from 1955–9. Richard Price, A Review of the Principal Questions in Morals. Oxford: Clarendon Press, 1948. John L. Mackie, Problems from Locke. Oxford: Clarendon Press, 1976. Private Collection. J. L. Mackie, The Miracle of Theism. Oxford: Clarendon press, 1982. Private Collection. D. D. Raphael, Adam Smith. Oxford: Oxford University Press, 1985. Private Collection. Criticism and the Growth of Knowledge. Edited by Imre Lakatos & Alan Musgrave. Cambridge: Cambridge University Press, 1970. Private Collection. Alan Musgrave, Common Sense, Science, and Scepticism: A Historical Introduction to the Theory of Knowledge. Cambridge: Cambridge University Press, 1993. Private Collection. Alan Musgrave, Essays on Realism and Rationalism. Amsterdam; Atlanta, Ga.: Rodopi, 1999. Private Collection. Peter R. Anstey, The Philosophy of Robert Boyle. New York: Routledge, 2000. Private Collection. Time and Ethics: Essays at the Intersection. Edited by Heather Dyke. Dordrecht [The Netherlands]; Boston [Mass. ]: Kluwer Academic Publishers, 2003. Private Collection. Rationality and Reality. Conversations with Alan Musgrave. Edited by Colin Cheyne and John Worrall. Dordrecht, The Netherlands: Springer, 2006. Private Collection. Heather Dyke, Metaphysics and the Representational Fallacy. London: Routledge, 2007. Private Collection. James Maclaurin and Kim Sterelny, What is Biodiversity? Chicago: University of Chicago Press, 2008. Private Collection. Gregory W. Dawes, Theism and Explanation. London: Routledge, 2009. Private Collection. Alan Musgrave, Secular Sermons: Essays on Science and Philosophy. Dunedin, N.Z. 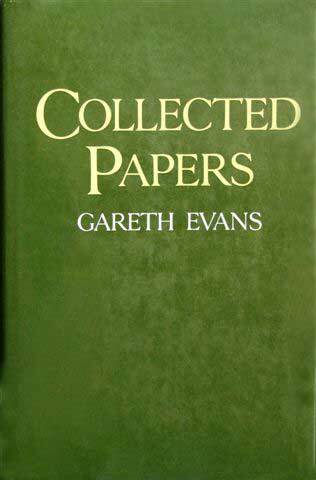 Otago University Press, 2009. Private Collection. Hume on Motivation and Virtue. Edited by Charles Pigden. London: Palgrave Macmillan, 2009. Private Collection. Hume on Is and Ought. Edited by Charles Pigden. New York: Palgrave Macmillan, 2010. Private Collection. 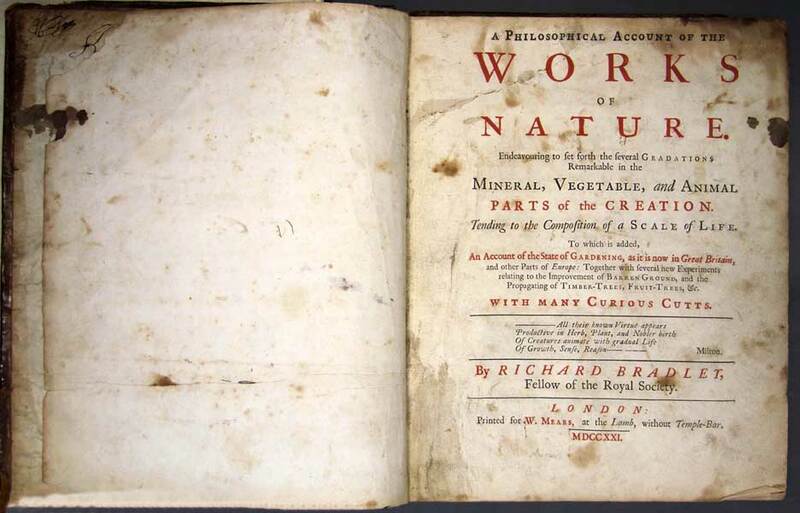 Peter Anstey, John Locke and Natural Philosophy. Oxford: Oxford University Press, 2011. Private Collection. 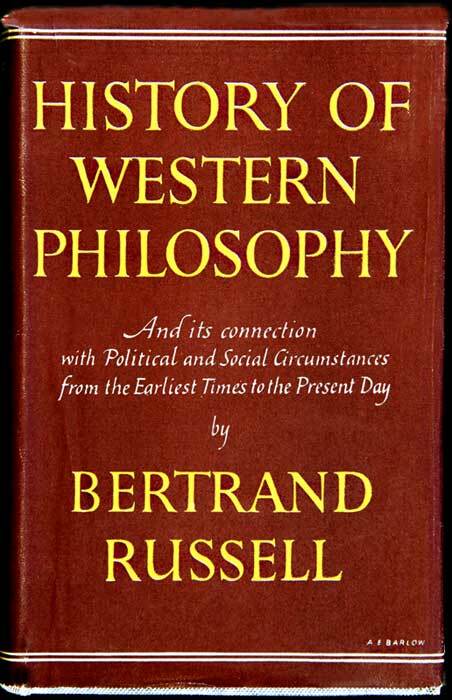 Dust jacket of Bertrand Russell’s A History of Western Philosophy. London: George Allen and Unwin, 1947. 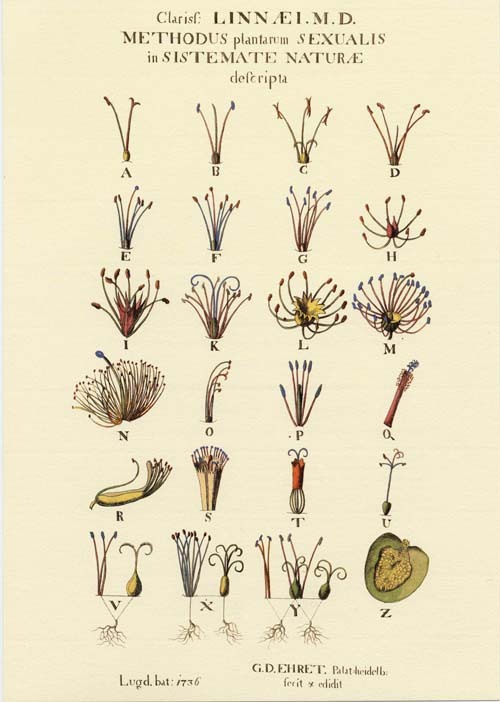 George Dionysius Ehret’s illustrations of Linnaeus’s sexual system of plant classification, 1736. 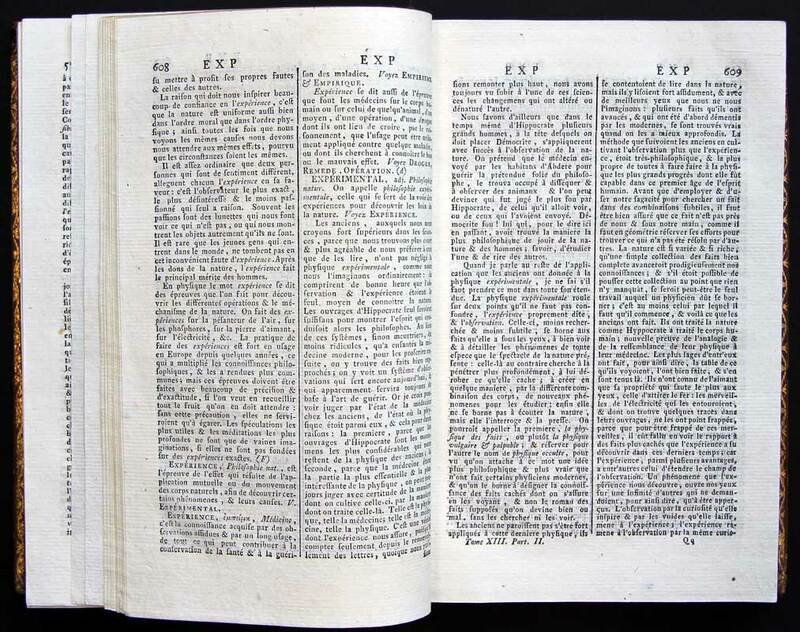 This point-by-point comparison of rationalism and empiricism (Rationalisme, top-left,and Empirisme, top-right) was published by the German philosopher Johann Gottlieb Selle in 1792 in the journal of the French Academy of Science and Literature. Kant’s first disciples and adversaries published several such comparisons to display the superiority of Kantian rationalism or anti-Kantian empiricism over its rival. Mémoires de l’Académie Royale, p. 608.